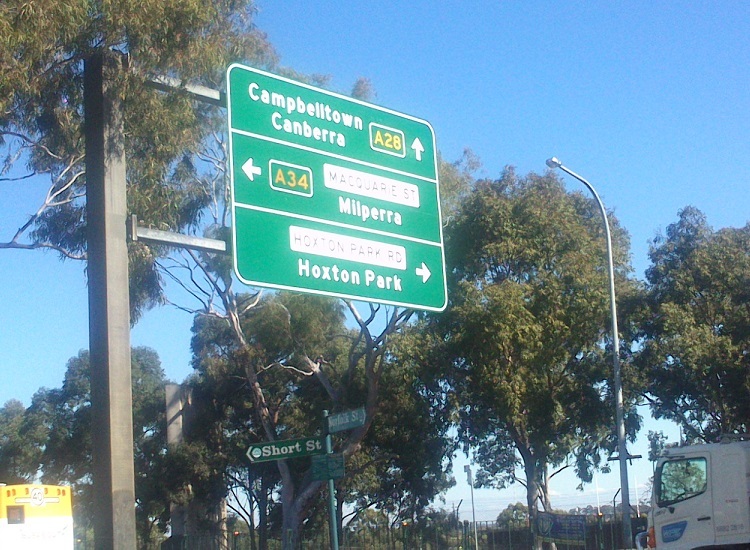 Exit Direction signs northbound on Hume Highway at the Camden Valley Way interchange, Prestons. Source: Daniel Thornton, June 2013. 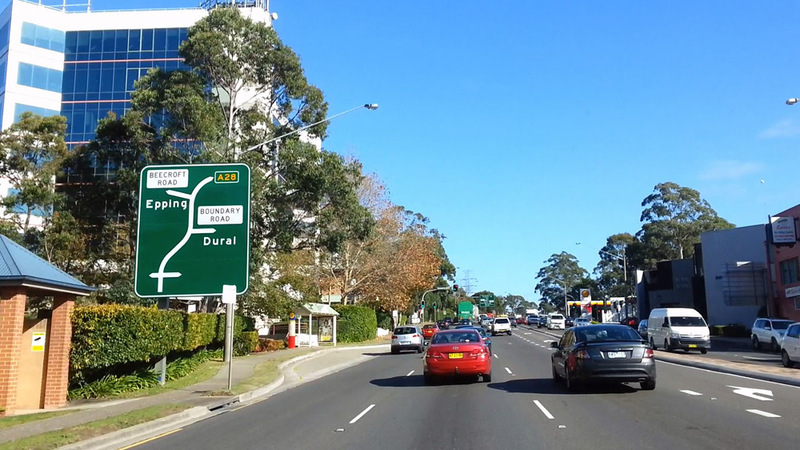 ID signage facing southbound traffic at the junction of Pacific Highway & Pennant Hills Road, Wahroonga. Source: Musa Hodzic, July 2013. 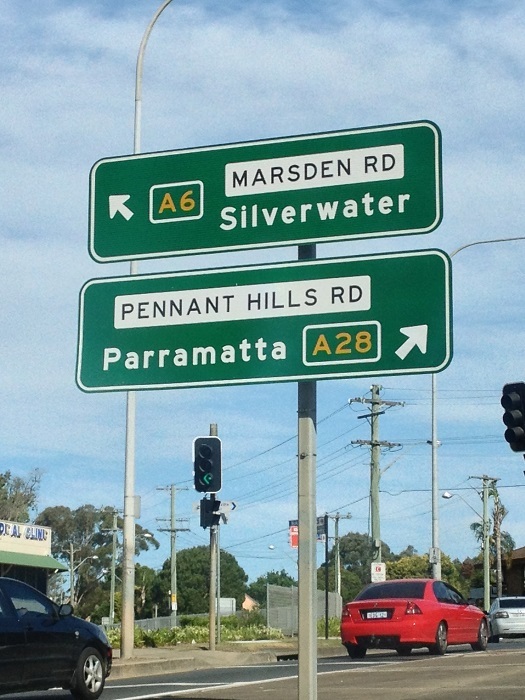 ID sign at the junction of Pennant Hills Road & Pacific Motorway, Wahroonga. Source: Daniel Thornton, June 2013. 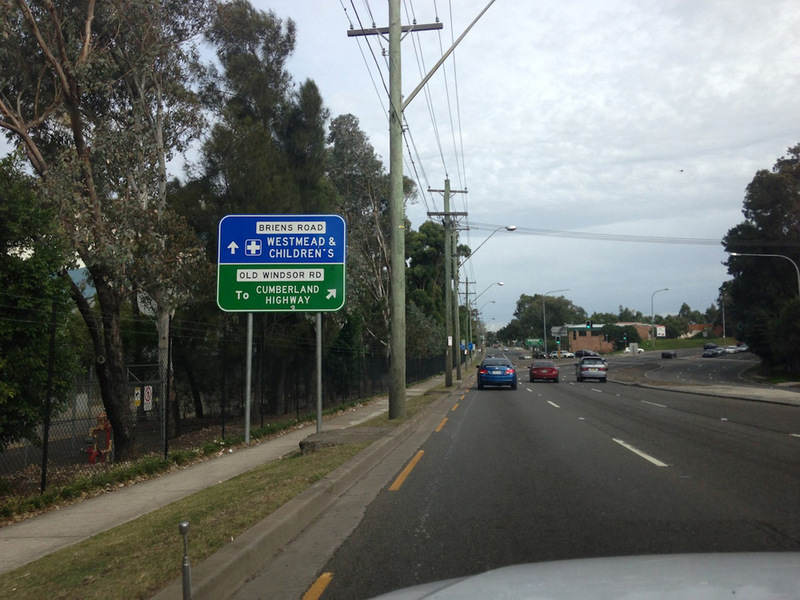 RD sign southbound on Pennant Hills Road after Hinemoa Avenue, Normanhurst. 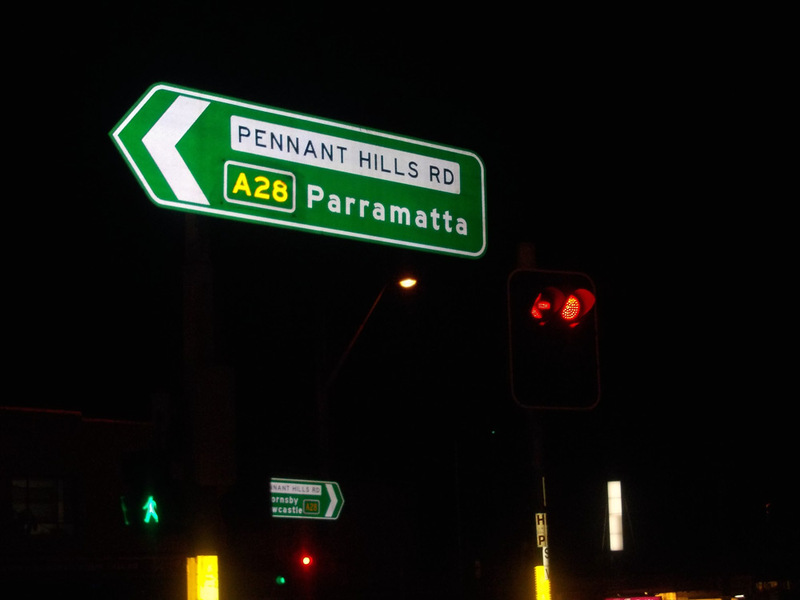 Diagrammatic AD sign southbound on Pennant Hills Road approaching the junction with Boundary Road, Pennant Hills. 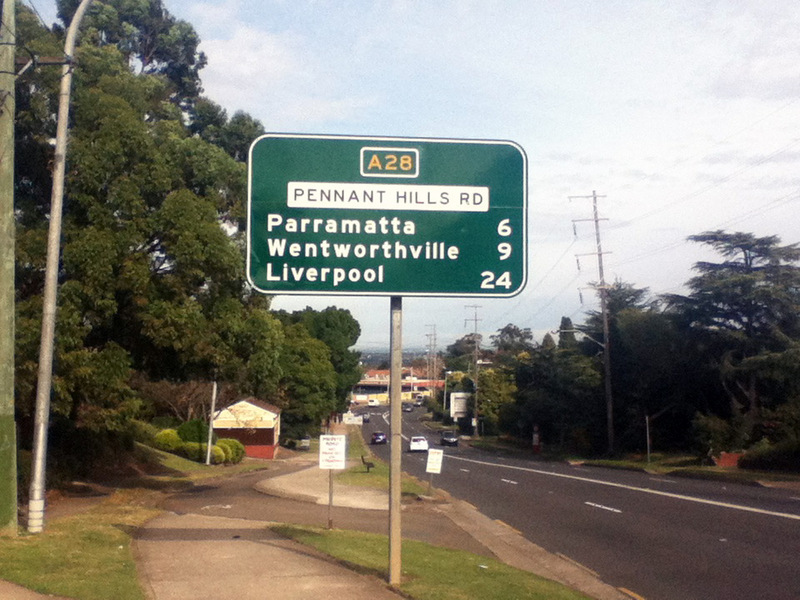 A28 route marker on an AD sign facing Boundary Road traffic at the junction of Pennant Hills Road & Boundary Road, Pennant Hills. 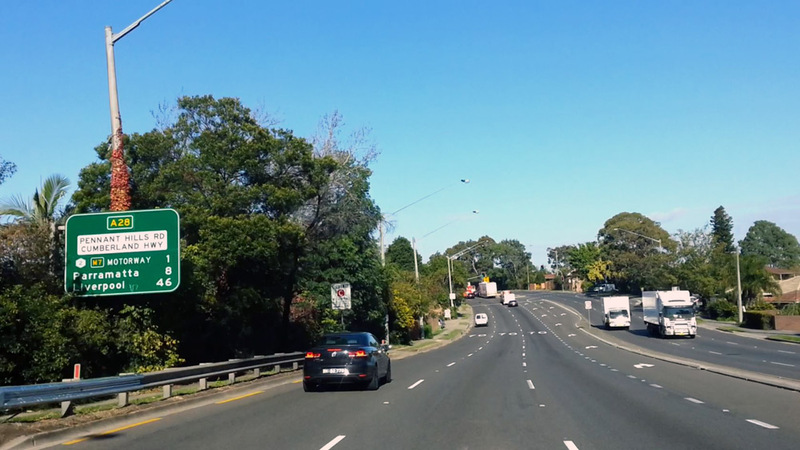 RD sign southbound on Pennant Hills Road between the two junctions with Beecroft Road, Pennant Hills. Note that this A28 route marker appears to be on a coverplate - perhaps it covers an A7 route marker? 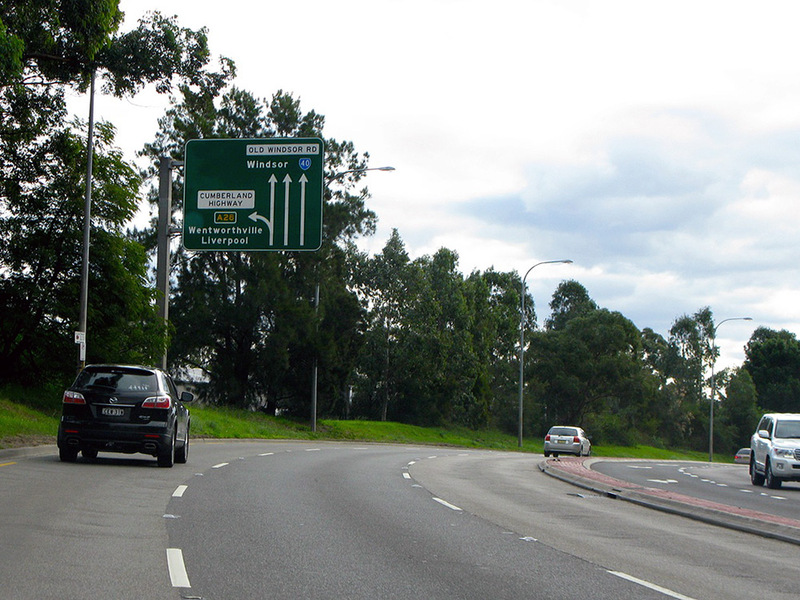 Diagrammatic AD sign southbound on Pennant Hills Road approaching Castle Hill Road, West Pennant Hills. 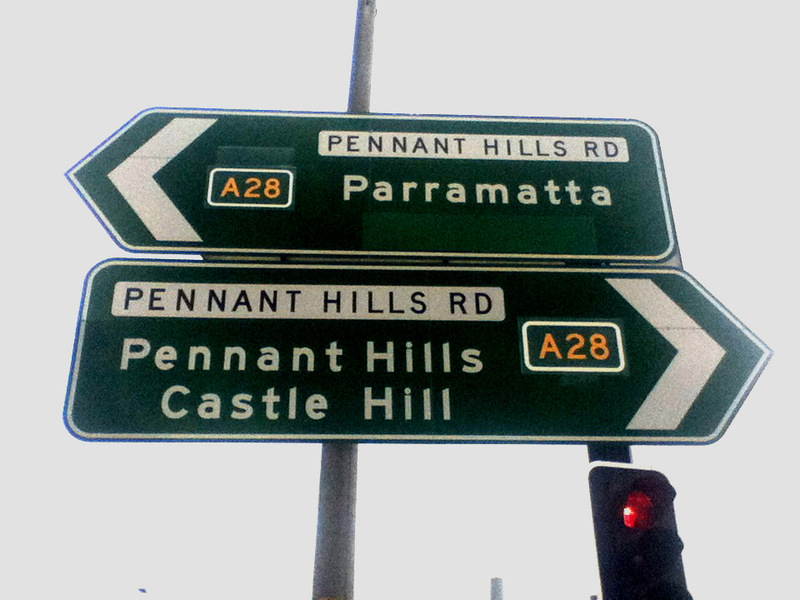 RD sign southbound on Pennant Hills Road after the junction with Castle Hill Road, West Pennant Hills. 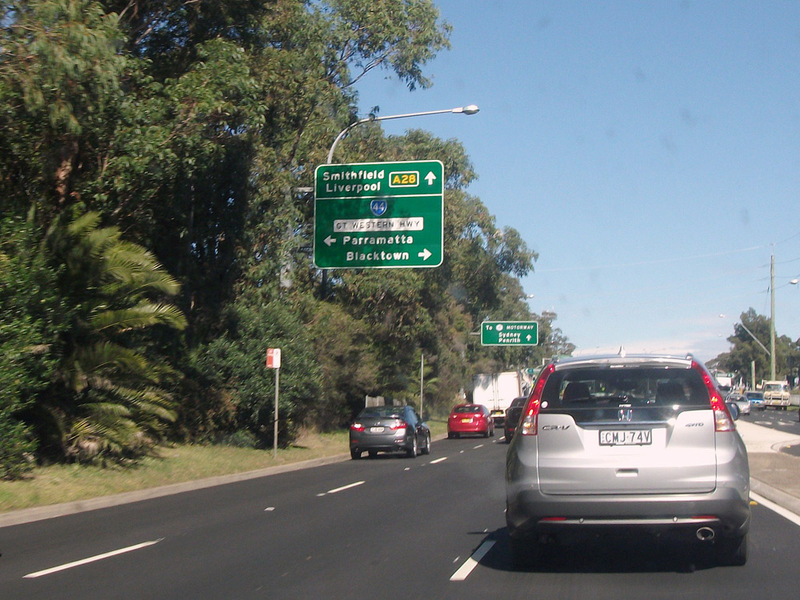 AD sign southbound on Pennant Hills Road approaching the junction with Hills Motorway at Carlingford. Note the blank coverplate which should have shown Metroad 6 prior to the implementation of alpha-numeric routes; and of course should have also been uncovered to show A28 by now. 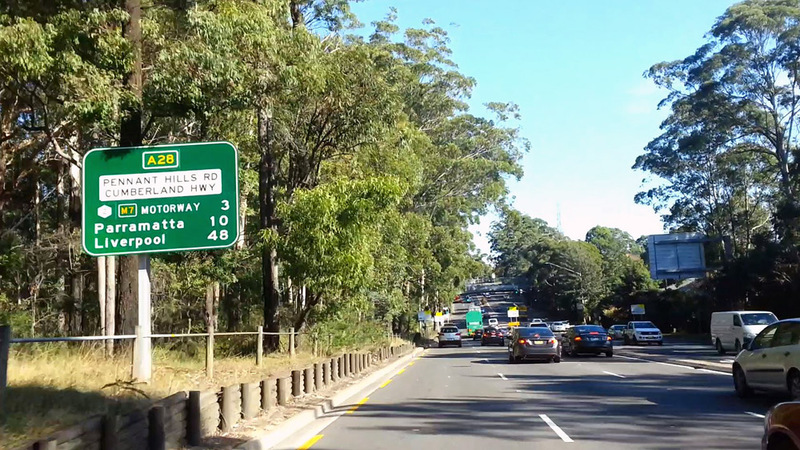 AD sign northbound on Pennant Hills Road approaching the junction with Hills Motorway at Carlingford. Source: Richard Ho, June 2013. 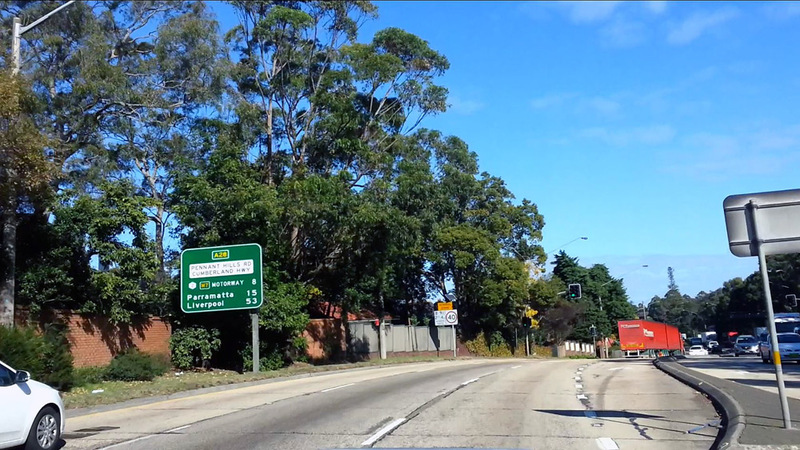 ID signs at the junction of Hills Motorway & Pennant Hills Road, Carlingford. 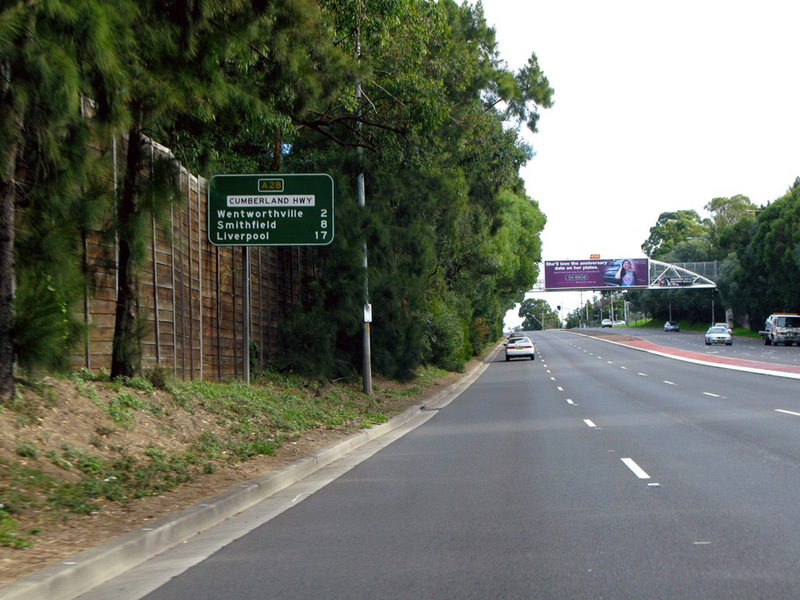 AD sign southbound on Pennant Hills Road approaching the junction with North Rocks Road, Carlingford. 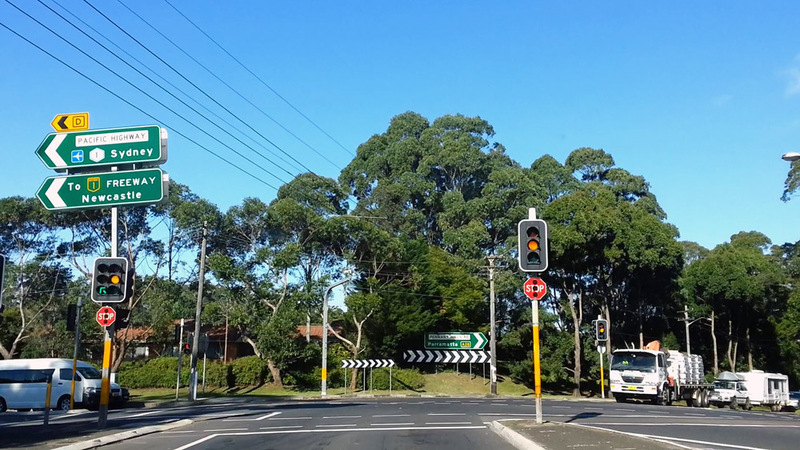 ID sign assembly at the junction of Pennant Hills Road & North Rocks Road, Carlingford. 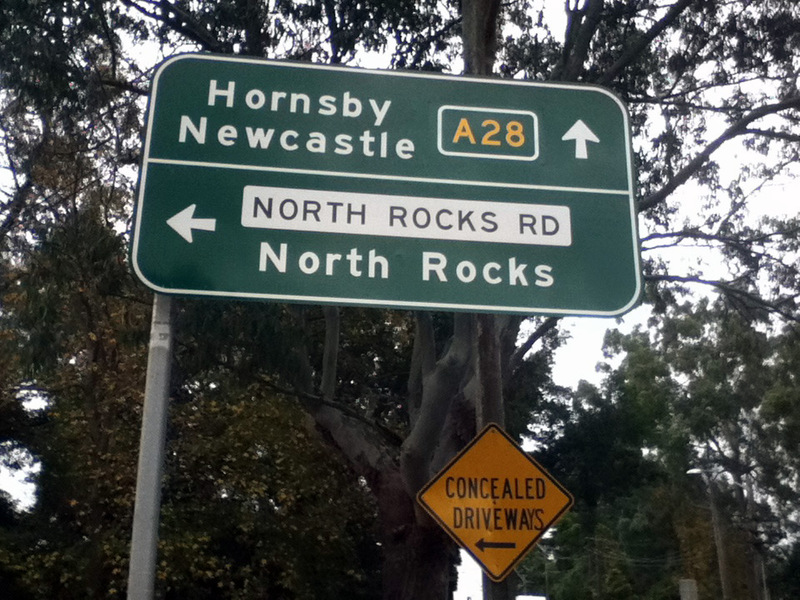 AD sign northbound on Pennant Hills Road approaching the junction with North Rocks Road, Carlingford. 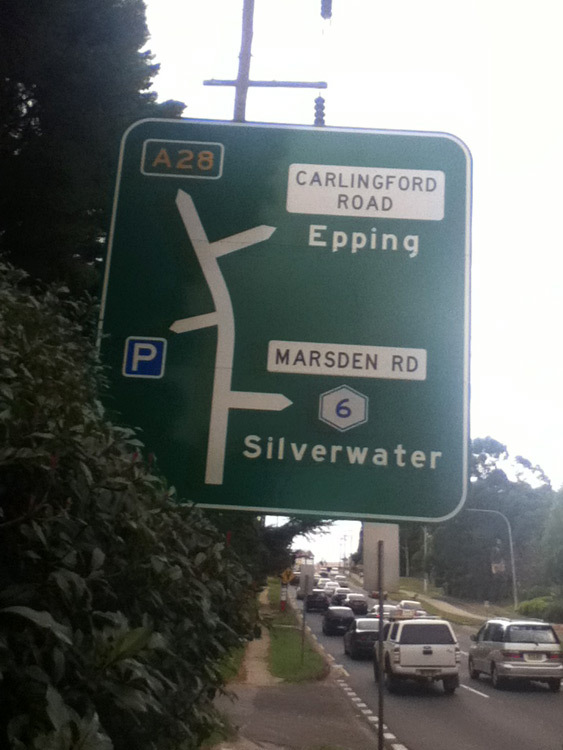 ID signs showing A28 route markers at the junction of Pennant Hills Road & Carlingford Road, Carlingford. 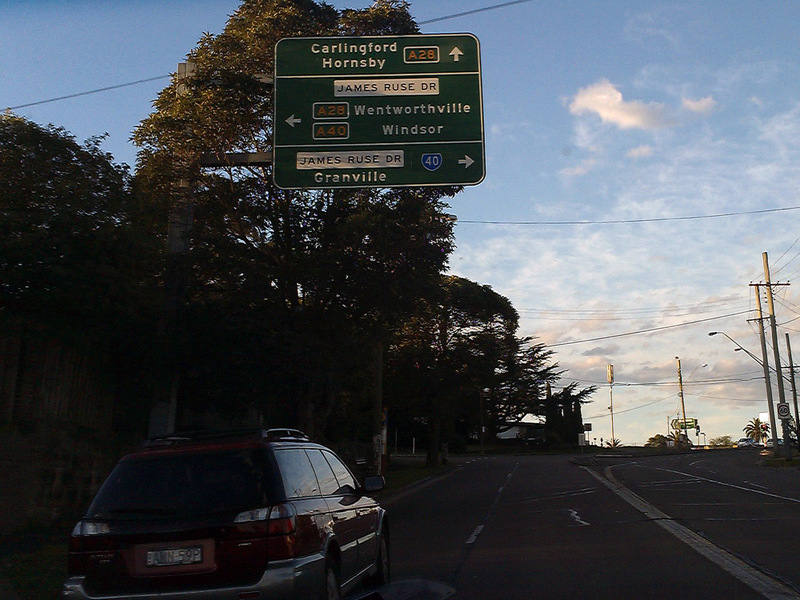 AD sign westbound on Carlingford Road approaching the junction with Pennant Hills Road, Carlingford. 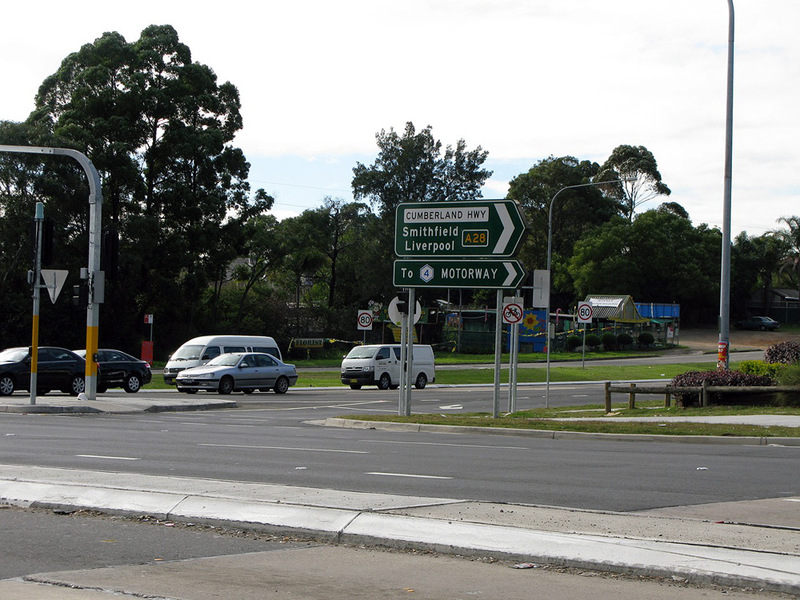 ID sign assembly facing southbound traffic at the junction of Pennant Hills Road & Marsden Road, Carlingford. 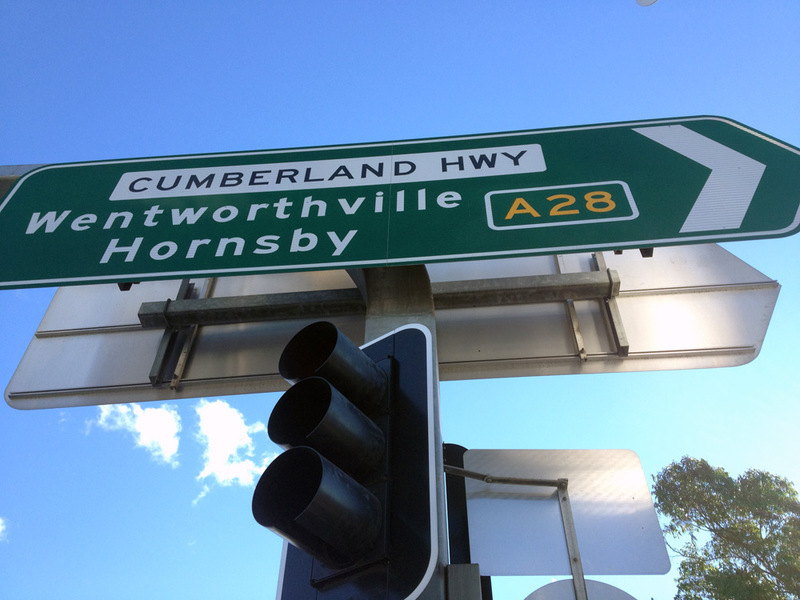 The first photo shows the sign after the unveiling of A28; the second shows the sign following the later unveiling of A6. Top photo: Cheston Mak, June 2013. Bottom photo: Spenser Tan, October 2013. 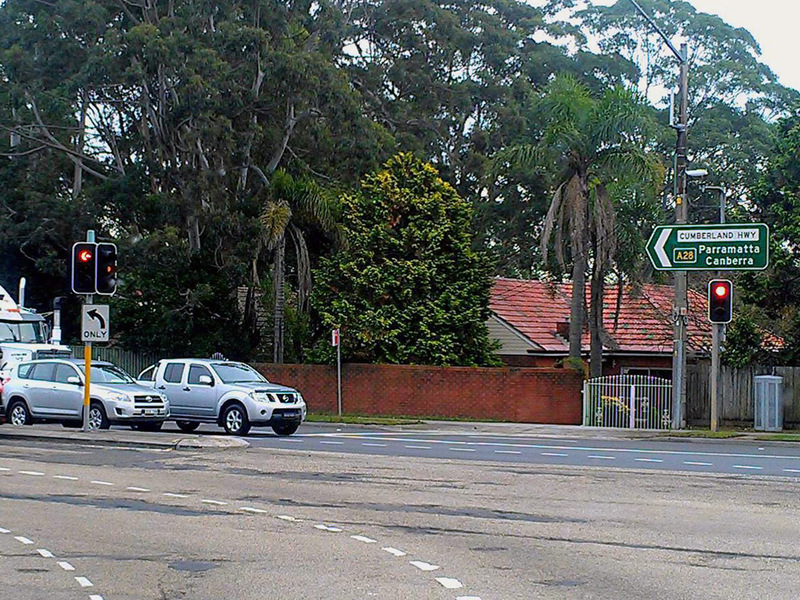 ID signs at the junction of Pennant Hills Road & Marsden Road, Carlingford. Source: Cheston Mak, June 2013. 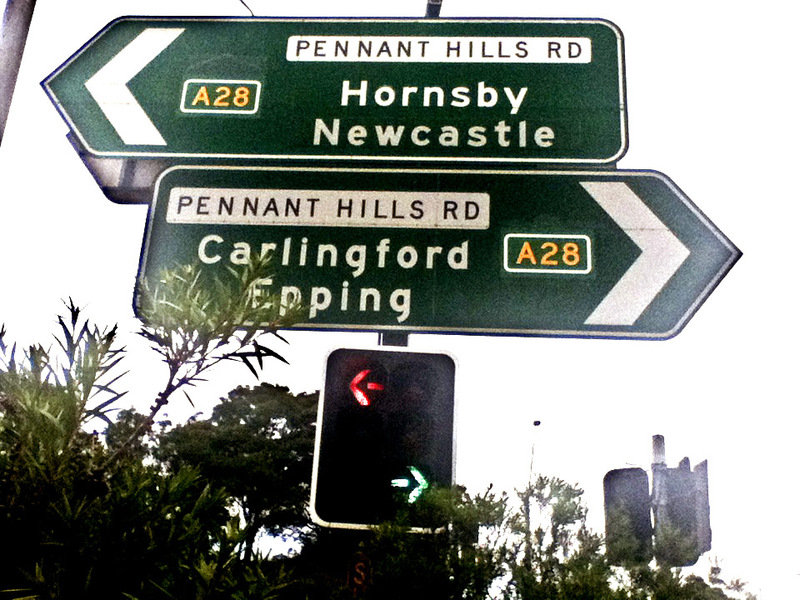 AD sign northbound on Marsden Road approaching the junction with Pennant Hills Road, Carlingford. 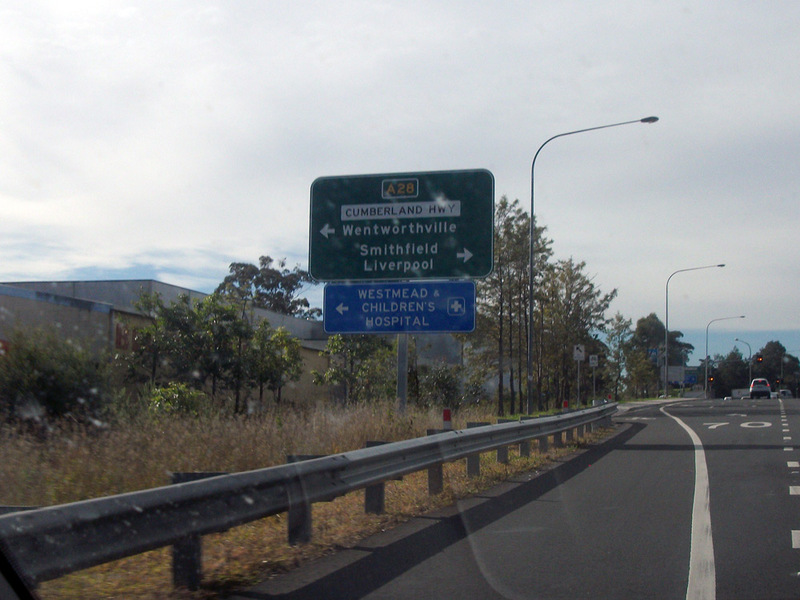 RD sign southbound on Pennant Hills Road after the junction with Marsden Road, Carlingford. Note the '24' has not been aligned correctly. 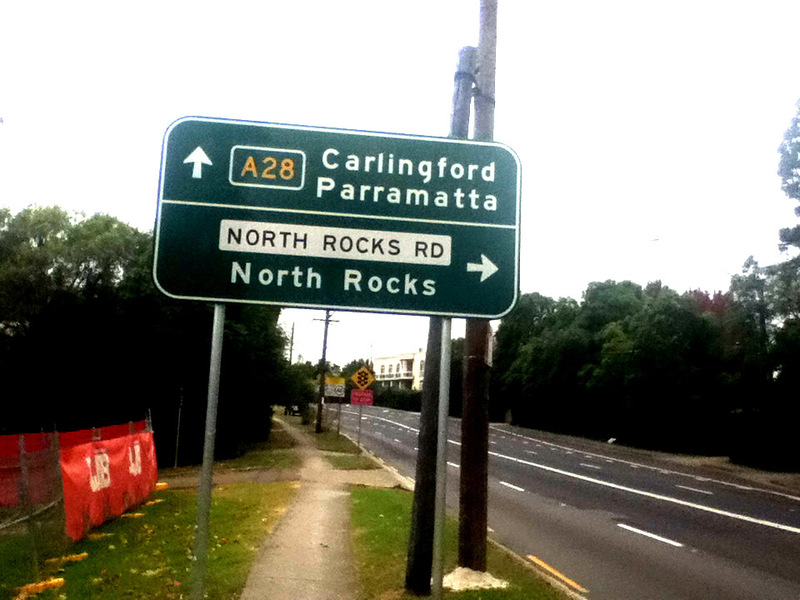 AD sign northbound on Pennant Hills Road approaching Marsden and Carlingford Roads, Carlingford. 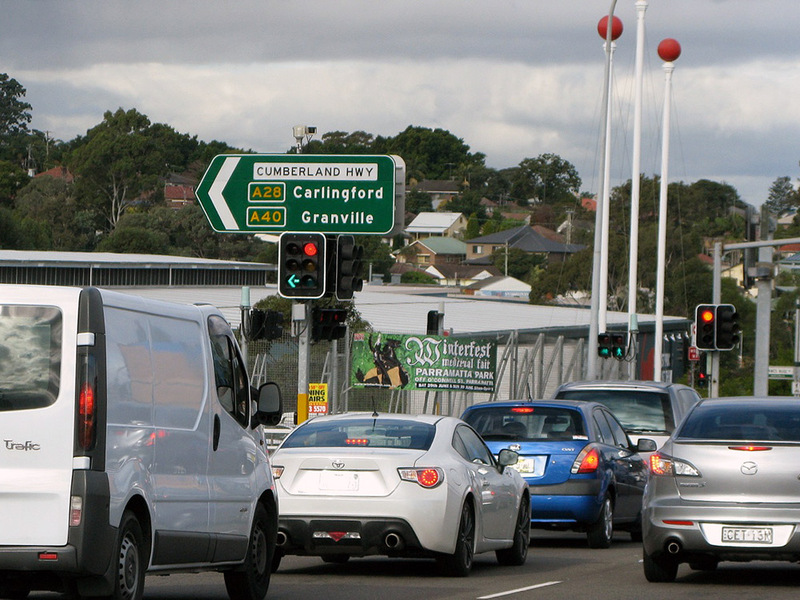 Coverplated AD sign northbound approaching the junction with Coleman Avenue, Carlingford. 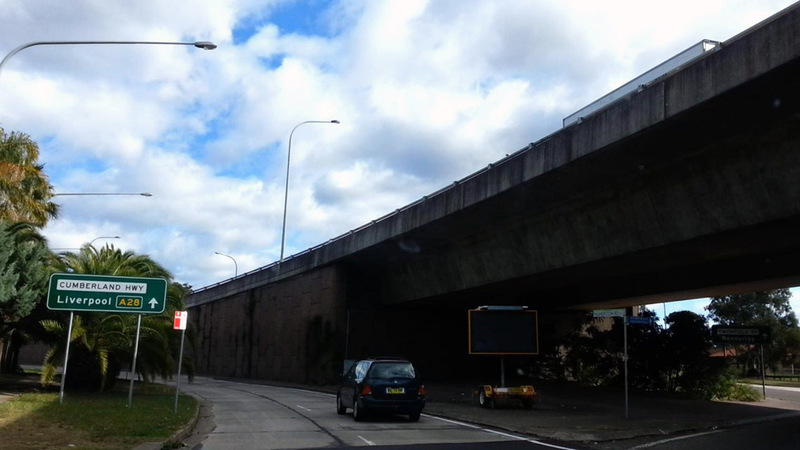 AD sign southwest bound on Pennant Hills Road approaching the junction with James Ruse Drive, North Parramatta.Note the A40 route marker has been uncovered at the same time as the A28 route marker, despite the remainder of route A40 not being uncovered until some months later. This was due to the fact that a single large coverplate covered both route markers. 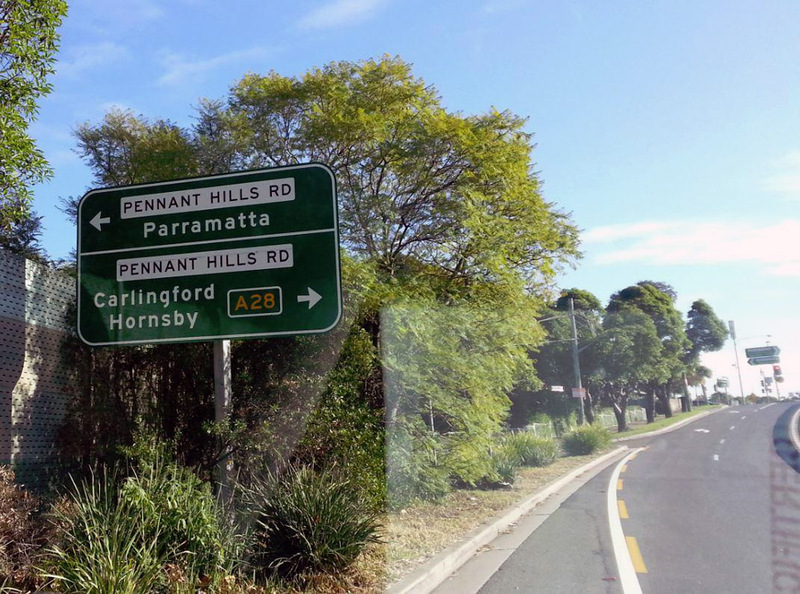 The first photo shows a prematurely uncovered A28 route marker on an AD sign northbound on Pennant Hills Road approaching James Ruse Drive, North Parramatta. 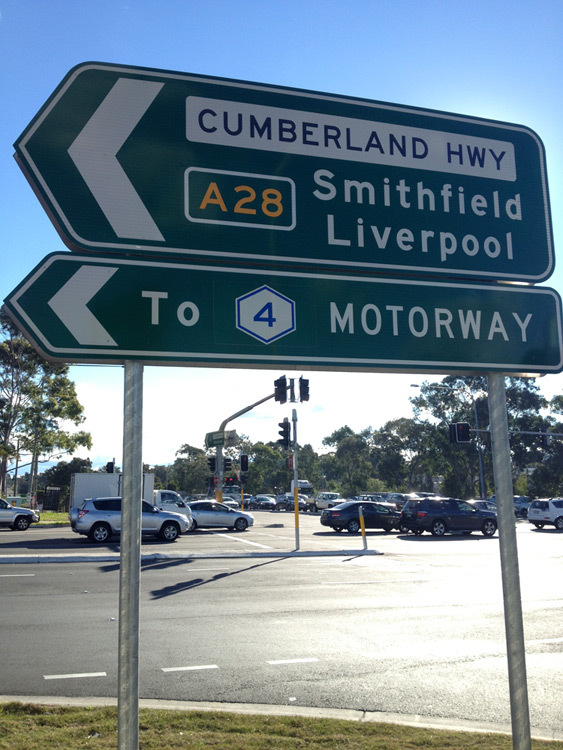 The second photo shows the same sign following the implementation of A28 in August 2013. Top photo: Leo Giusti, September 2012. Bottom photo: Leo Giusti, August 2013. 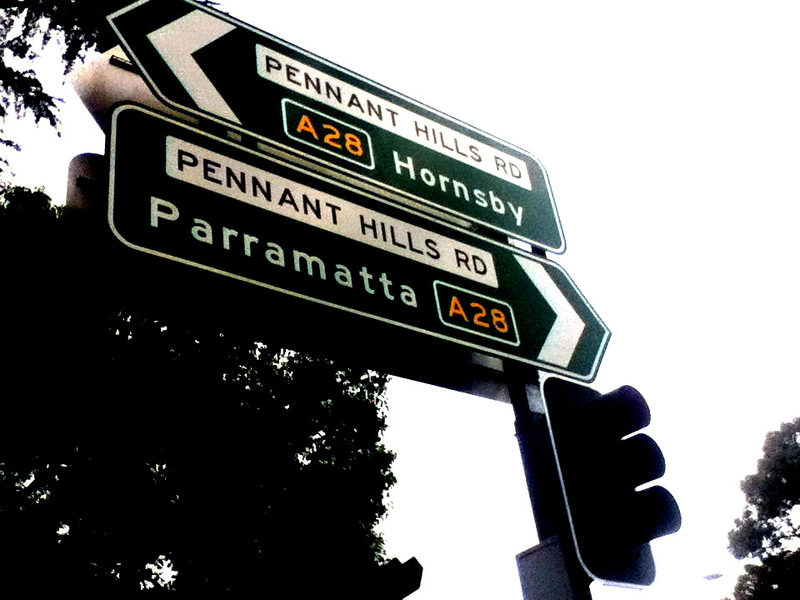 AD sign northbound on the James Ruse Drive off-ramp to Pennant Hills Road, North Parramatta. 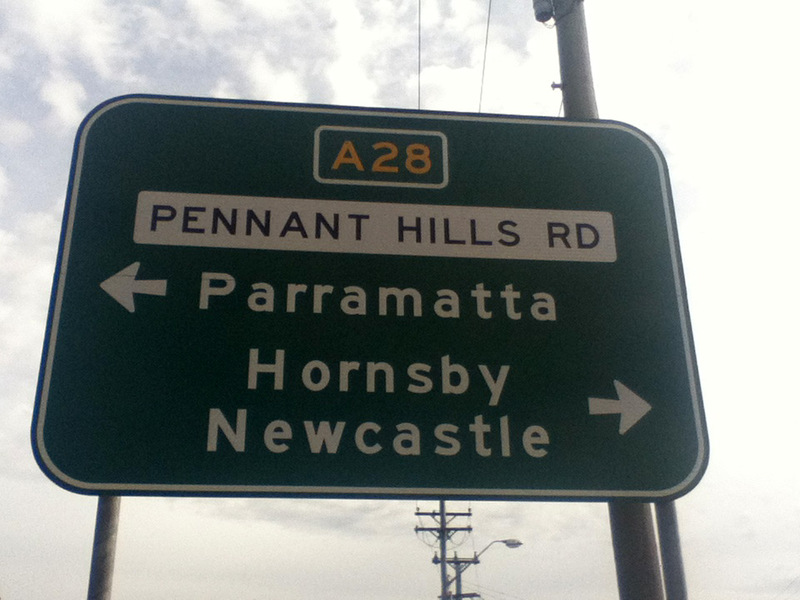 ID sign pointing northwards at the junction of Pennant Hills Road & James Ruse Drive, North Parramatta. Note the A40 route marker has been uncovered at the same time as the A28 route marker, despite the remainder of route A40 not being uncovered until some months later. This was due to the fact that a single large coverplate covered both route markers. 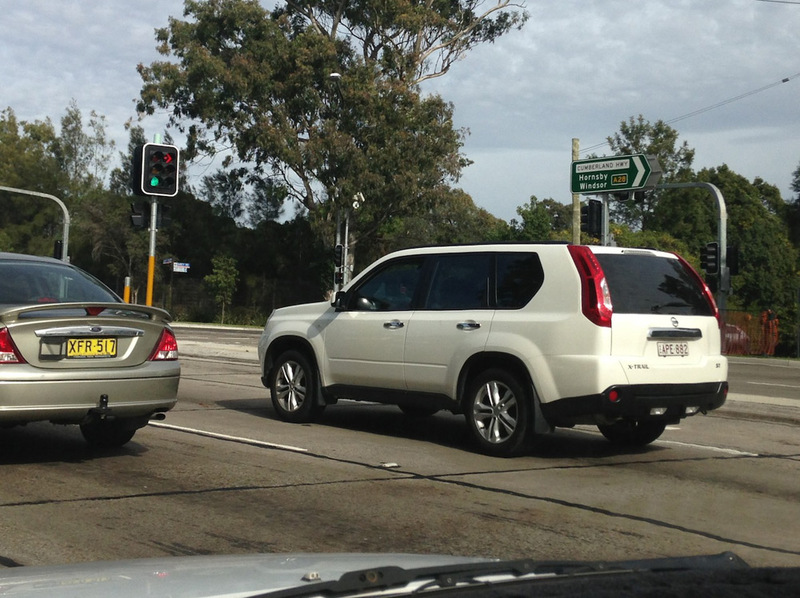 ID sign facing southbound traffic at the junction of Cumberland Highway/James Ruse Drive & Windsor Road, Northmead. Source: Anthony Rassias, June 2013. 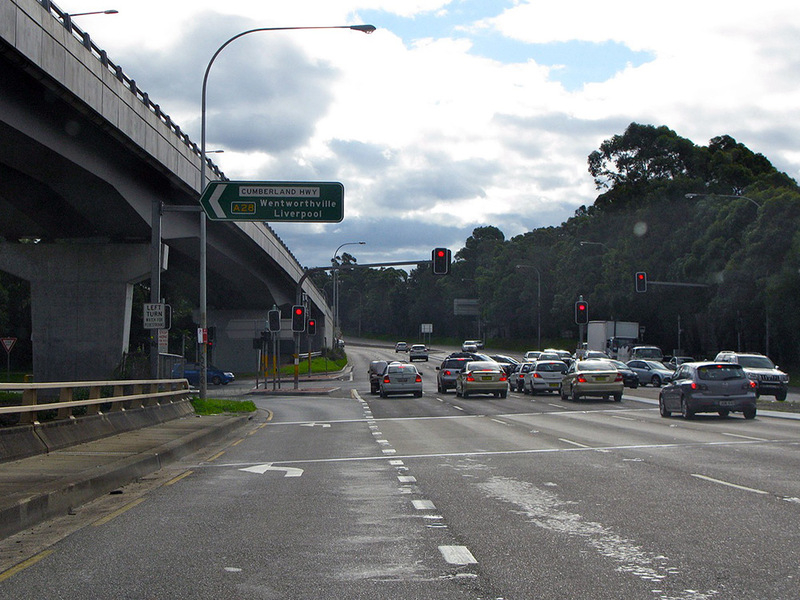 ID signs pointing west at the junction of Cumberland Highway/James Ruse Drive & Windsor Road, Northmead. Top photo: Anthony Rassias, June 2013. Bottom photo: Paul Mech, June 2013. 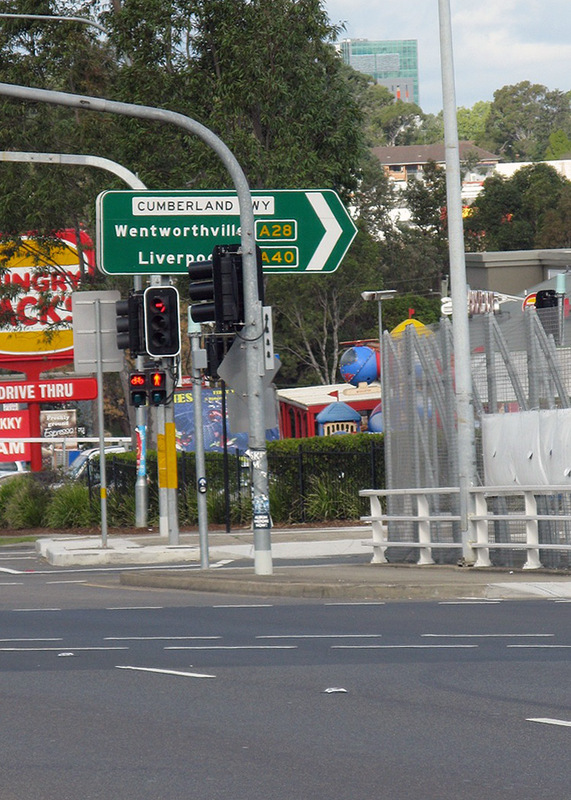 AD sign northbound on Windsor Road approaching the junction with Cumberland Highway/James Ruse Drive, Northmead. Source: Conrad Zalewski, June 2013. 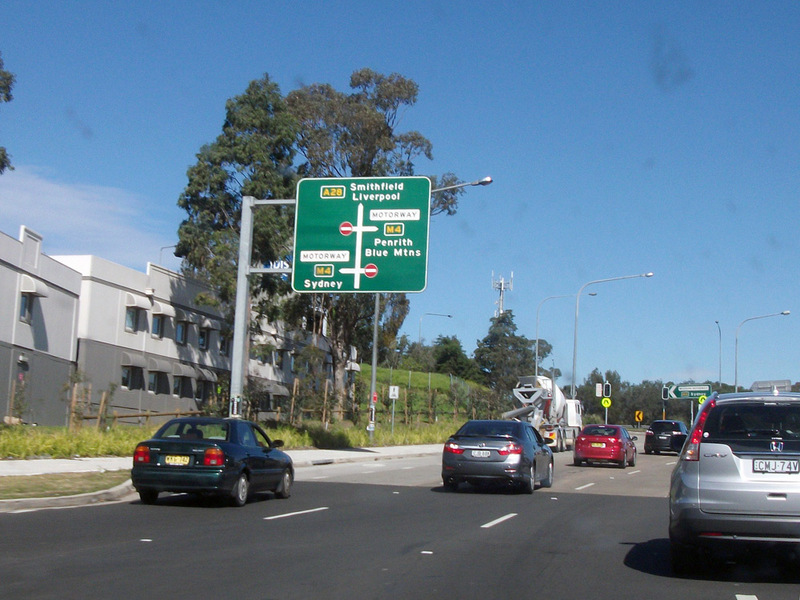 AD sign westbound on Cumberland Highway (Briens Road) approaching the junction with Briens Road at Northmead. 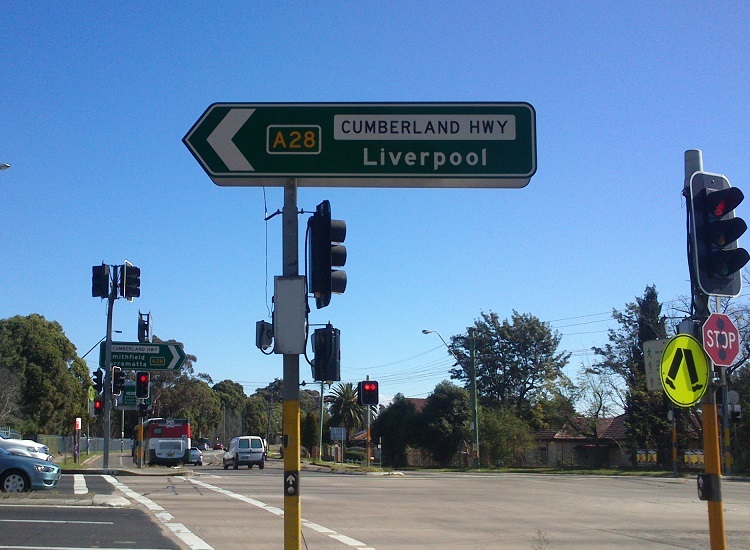 Note the missing A28 and A40 route markers. 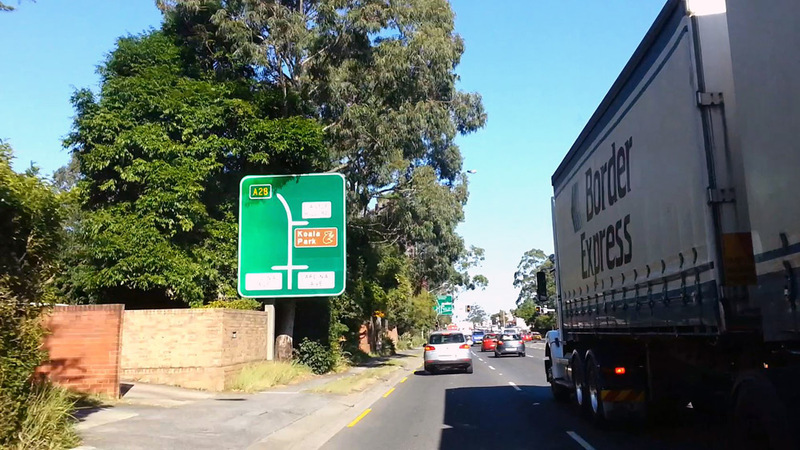 ID sign westbound on Cumberland Highway (Briens Road) at the junction with Briens Road at Northmead. 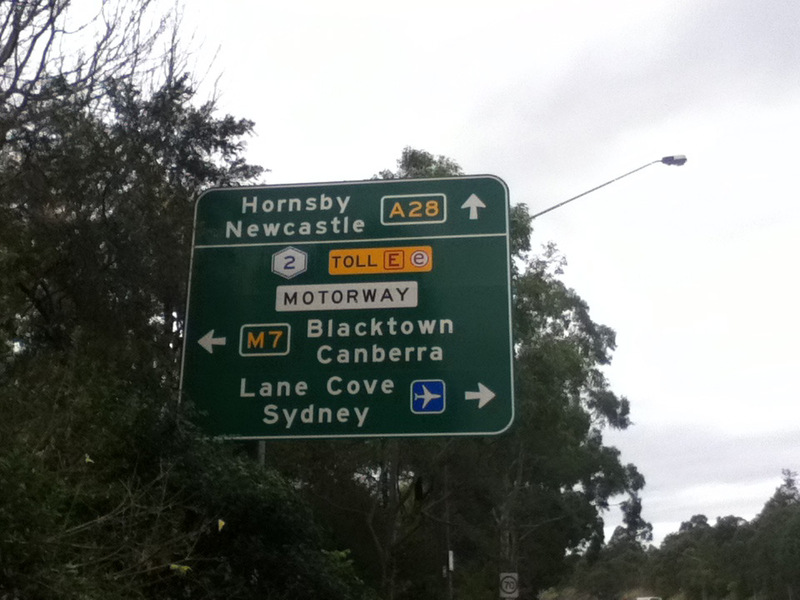 Note the missing A28 and A40 route markers. 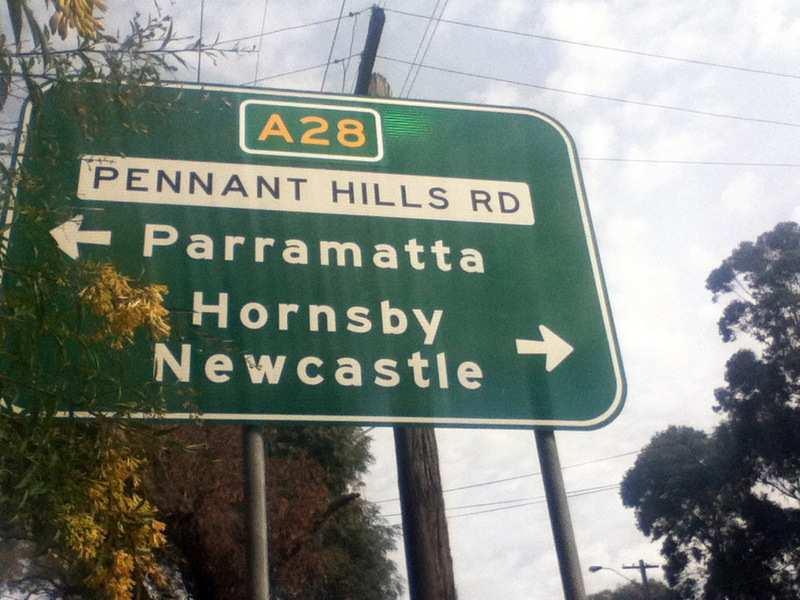 AD sign northbound on Cumberland Highway approaching the junction with Old Windsor Road, Old Toongabbie. 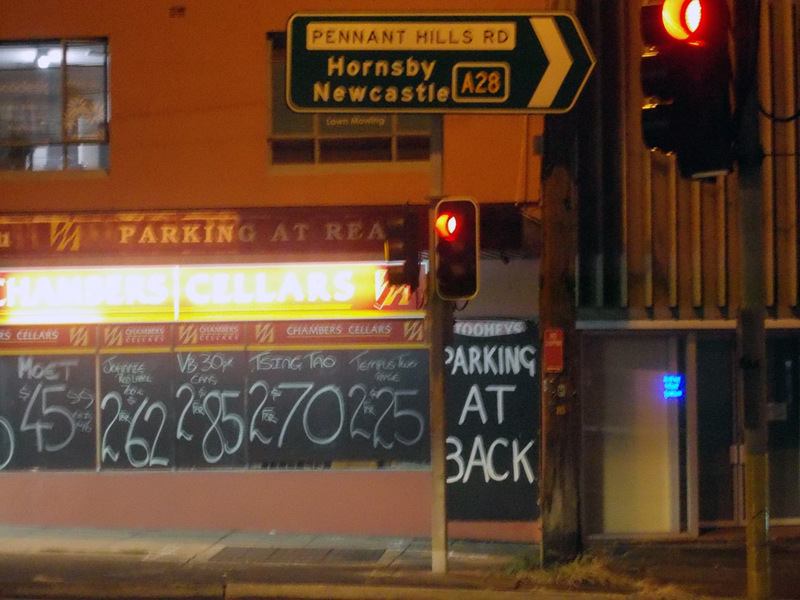 Note that A40 has yet to be uncovered on this sign, unlike some of the previous signs. 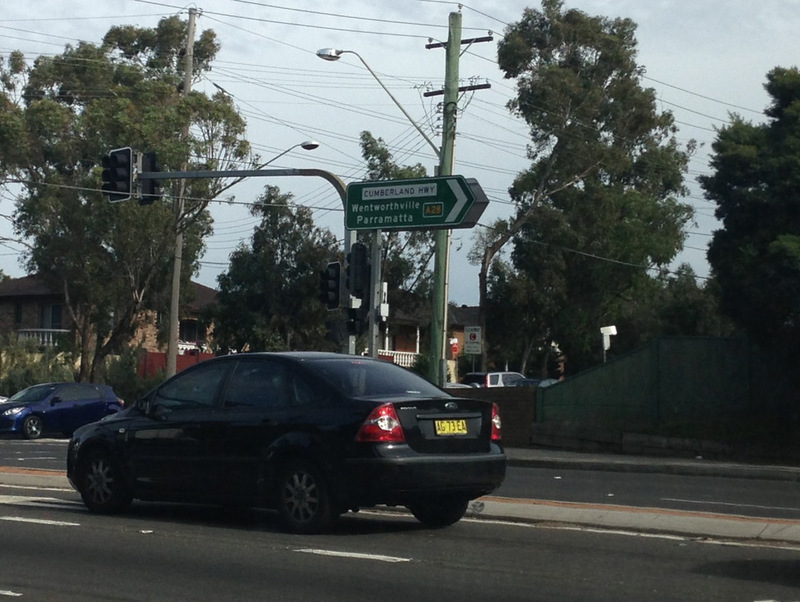 ID sign facing northbound traffic at the junction of Cumberland Highway & Old Windsor Road, Old Toongabbie. 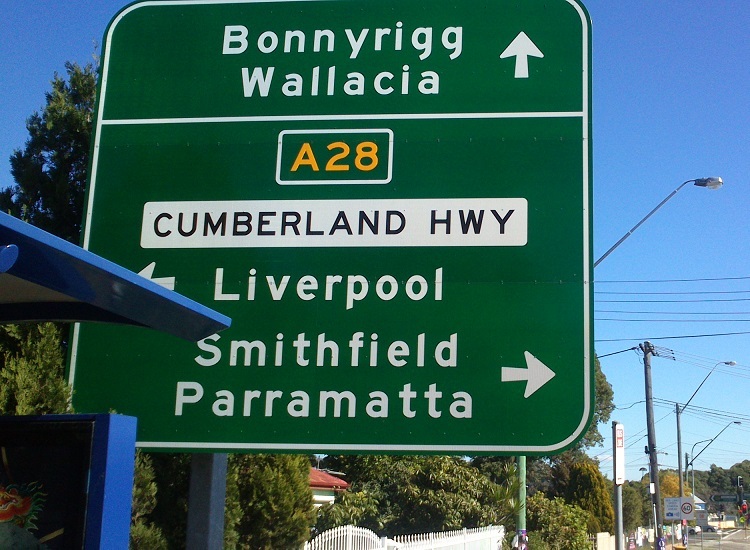 RD sign westbound on Cumberland Highway after the junction with Old Windsor Road, Old Toongabbie. 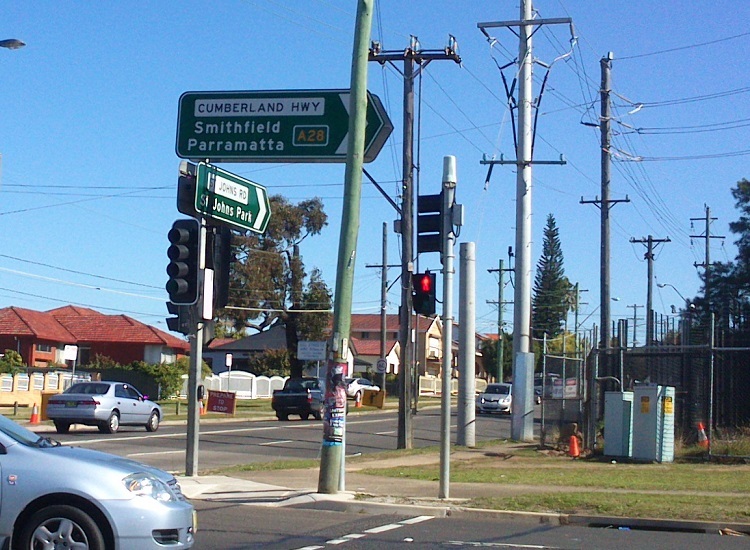 ID signs at the junction of Cumberland Highway & Darcy Road, Wentworthville. Top photo: Conrad Zalewski, June 2013. Bottom photo: Anthony Rassias, June 2013. 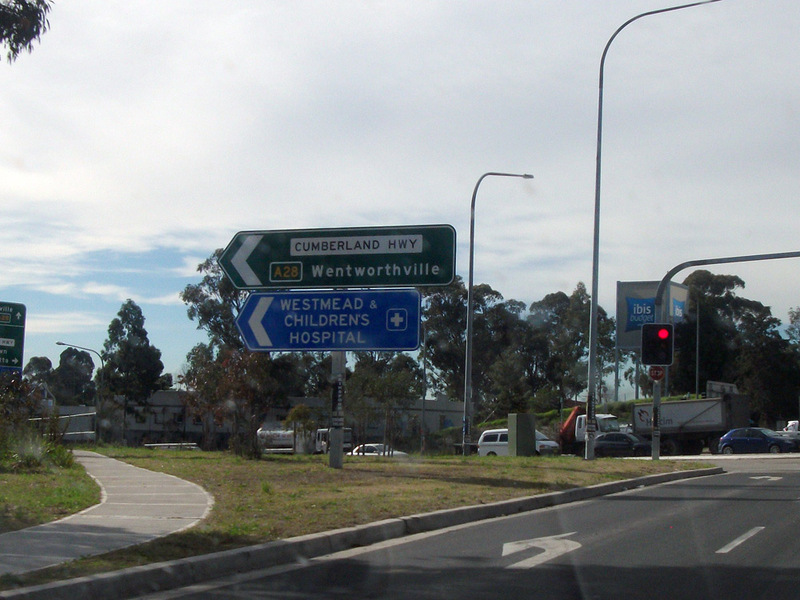 AD sign southbound on Cumberland Highway approaching the junction with Great Western Highway, Wentworthville. Source: Dean Pryke, August 2013. 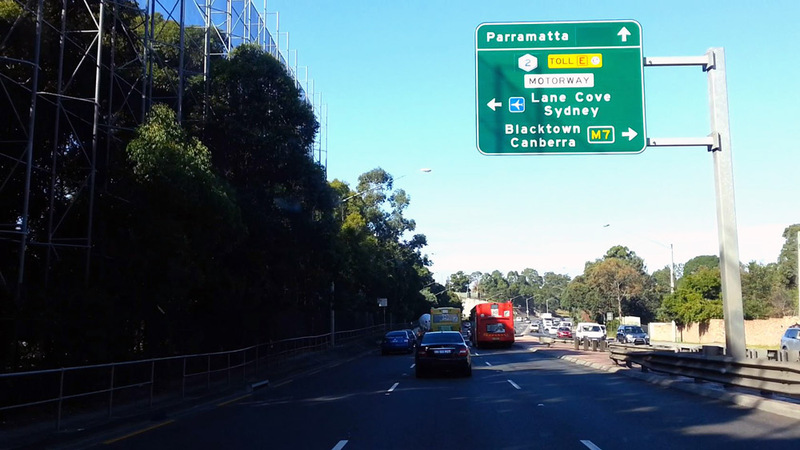 Lane allocation AD sign eastbound on Great Western Highway approaching the junction with Cumberland Highway, Wentworthville. 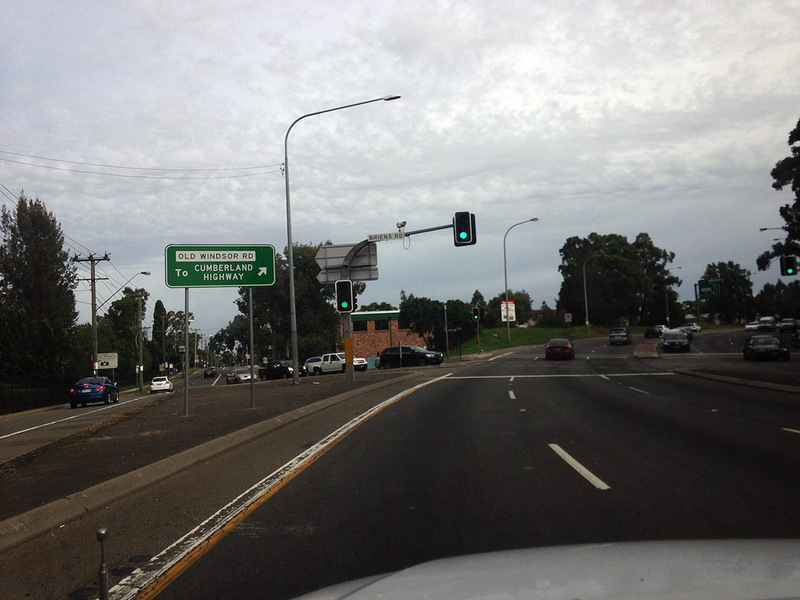 This sign illustrates that drivers need to be in the left-most right turn lane to enter the Western Motorway. 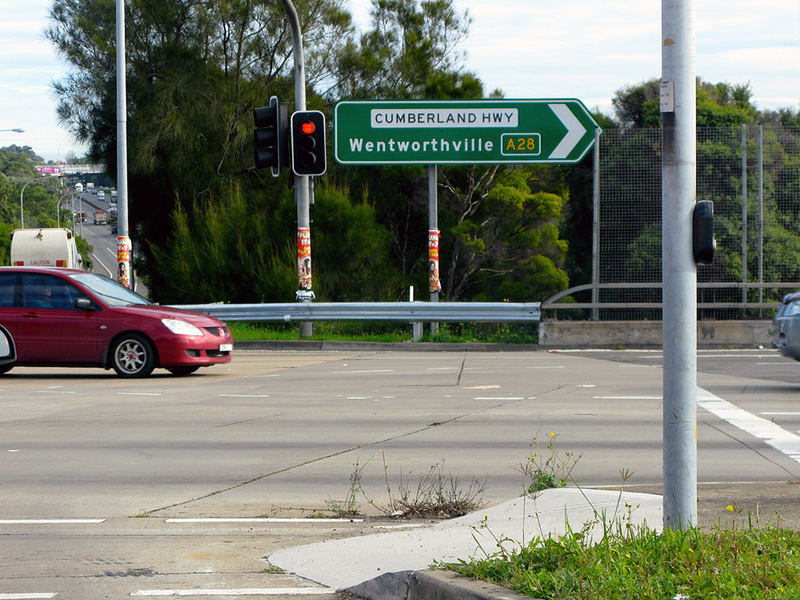 ID signs at the junction of Great Western Highway & Cumberland Highway, Wentworthville. Top & bottom photos: Erk, June 2013. Middle photo: Anthony Rassias, June 2013. 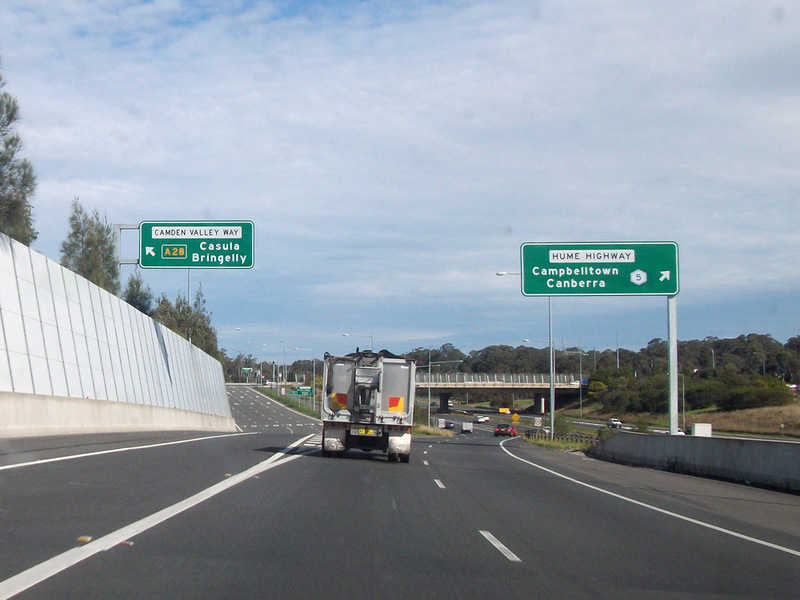 AD sign northbound on Cumberland Highway approaching the junction with Great Western Highway, Wentworthville. 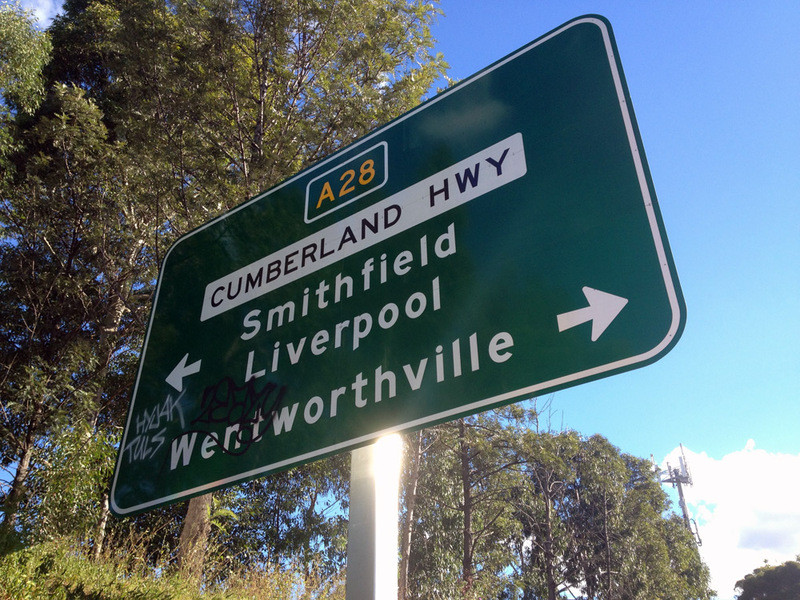 AD sign southbound on Cumberland Highway approaching the junction with the Western Motorway, South Wentworthville. 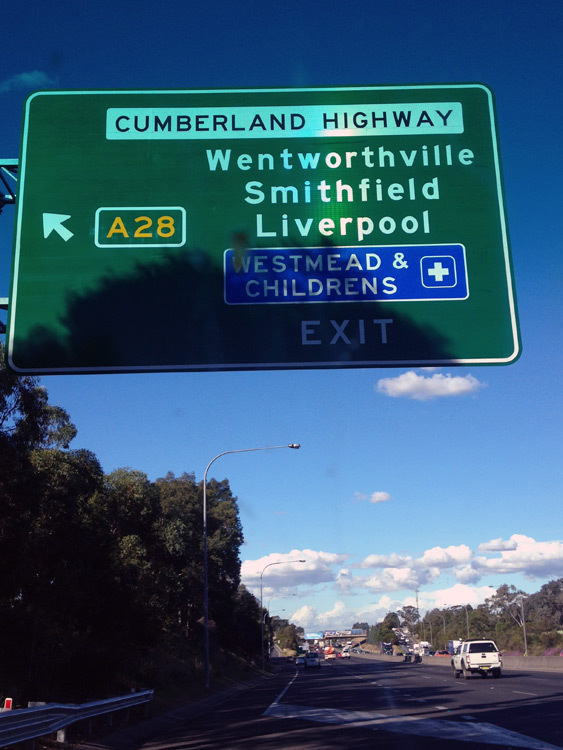 Eastbound signs on Western Motorway approaching the junction with Cumberland Highway, South Wentworthville. Photos 1-3 & 6: Erk, June 2013. Photos 4 & 5: Dean Pryke, August 2013. 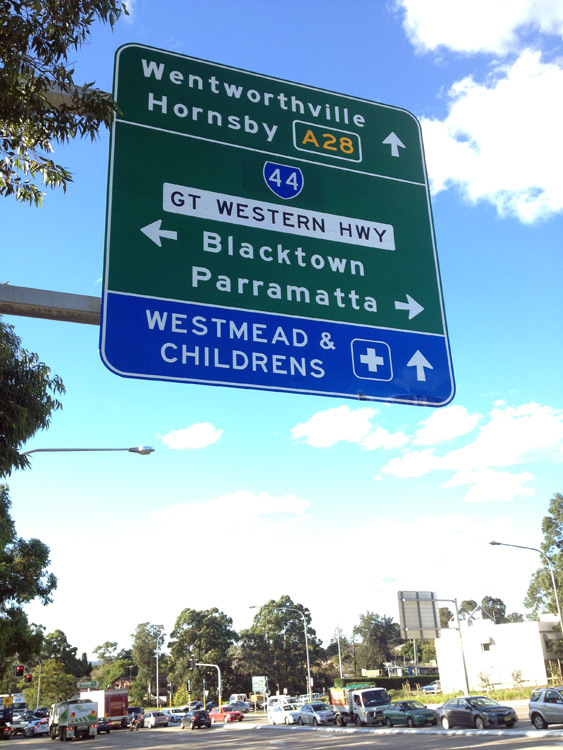 Signage on the westbound off-ramp from Western Motorway to Cumberland Highway, South Wentworthville. Top and middle photos: Erk, June 2013. 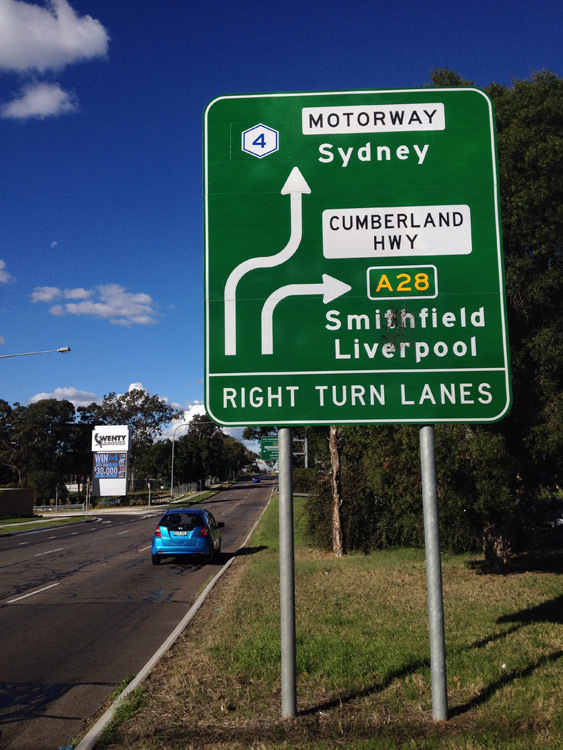 AD sign southbound on Cumberland Highway approaching the junction with Merrylands Road, Merrylands West. 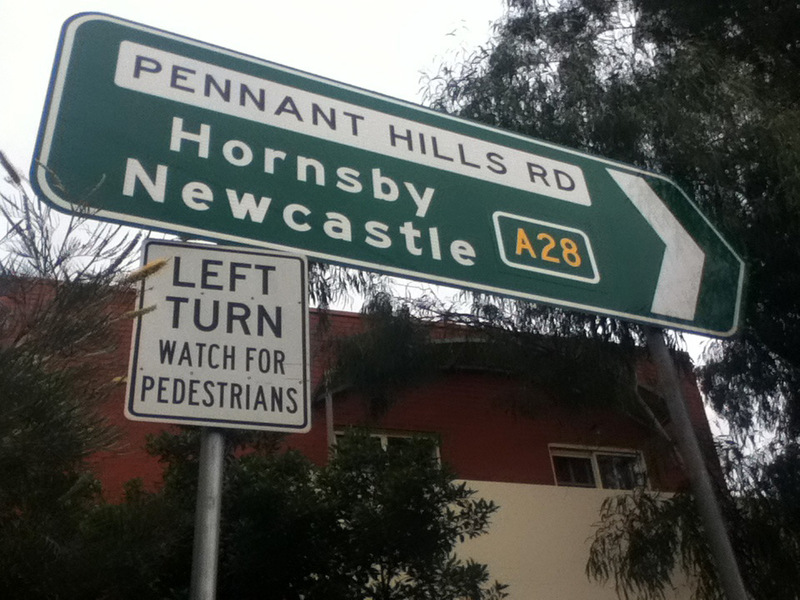 ID sign pointing northwards at the junction of Cumberland Highway & Merrylands Road, Merrylands West. 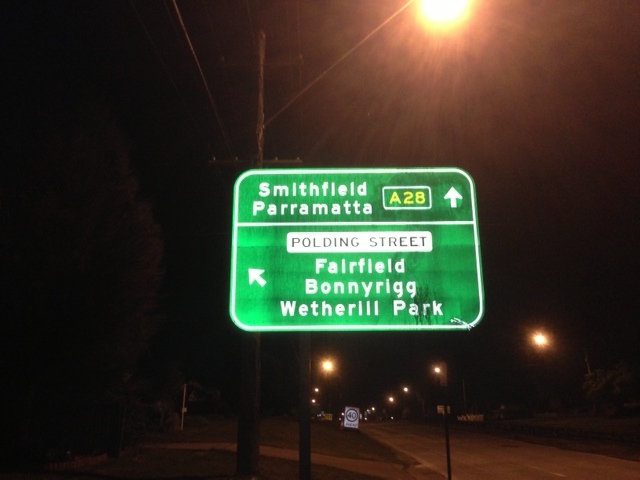 AD sign westbound on Polding Street approaching the junction with Cumberland Highway & Polding Street, Fairfield West. 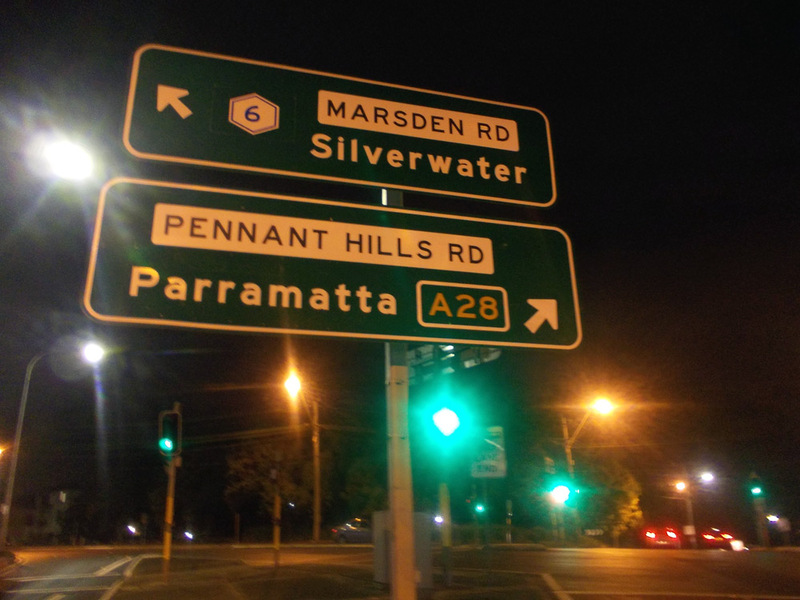 Note the differently sized route markers on the same sign. 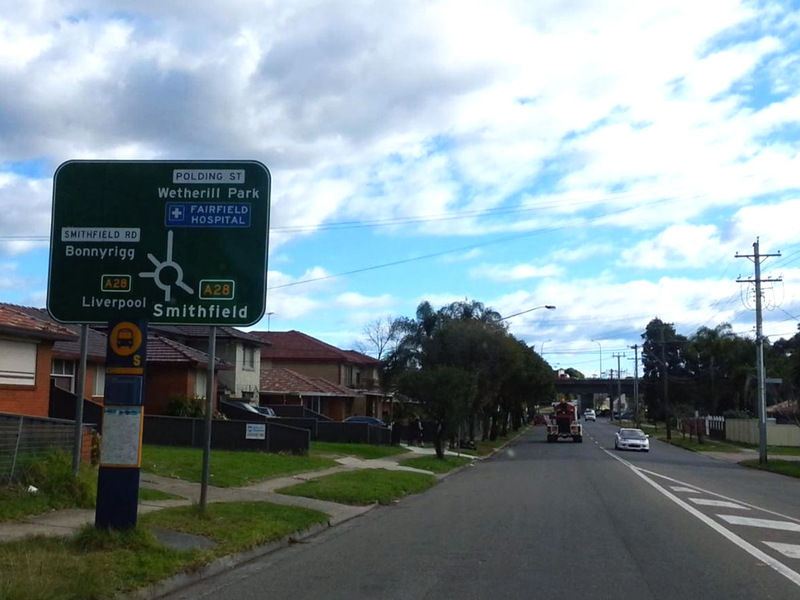 AD sign northbound on Smithfield Road approaching the junction with Cumberland Highway & Polding Street, Fairfield West. 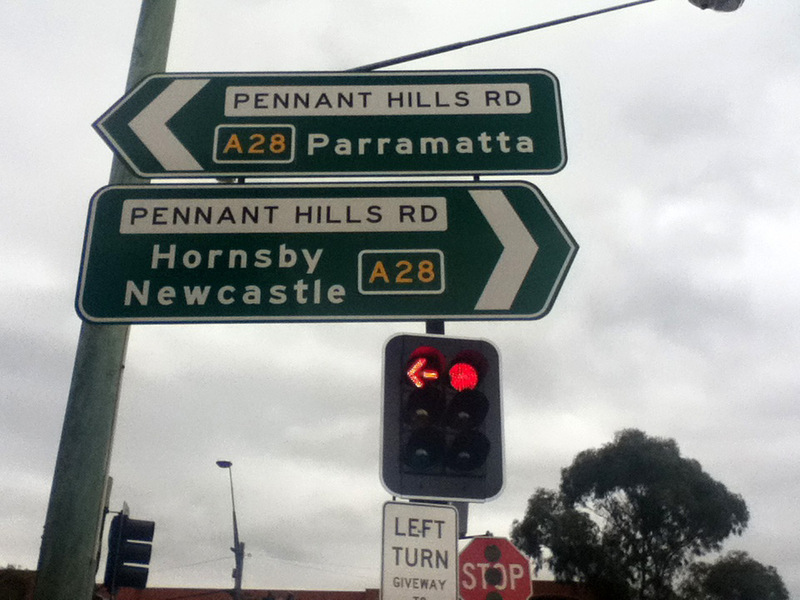 Note the differently sized route markers on the same sign. 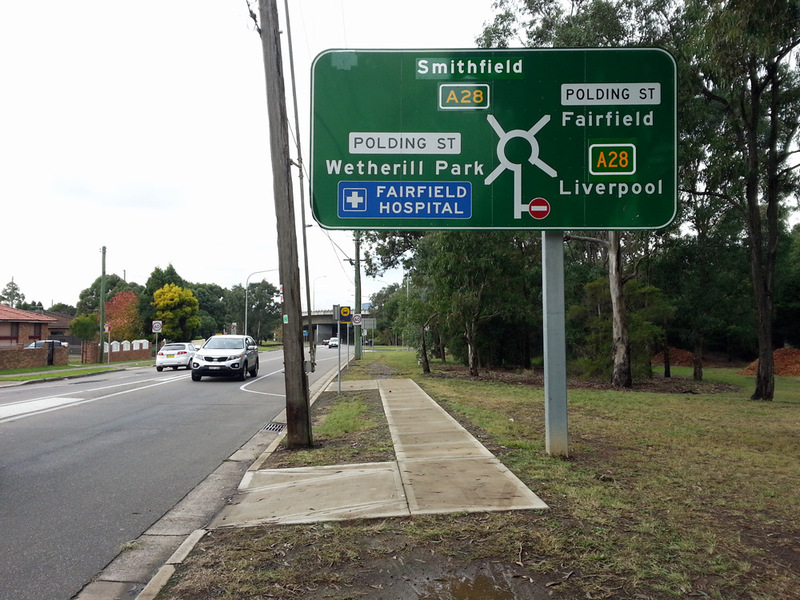 AD sign eastbound on Polding Street approaching the junction with Cumberland Highway & Polding Street, Fairfield West. 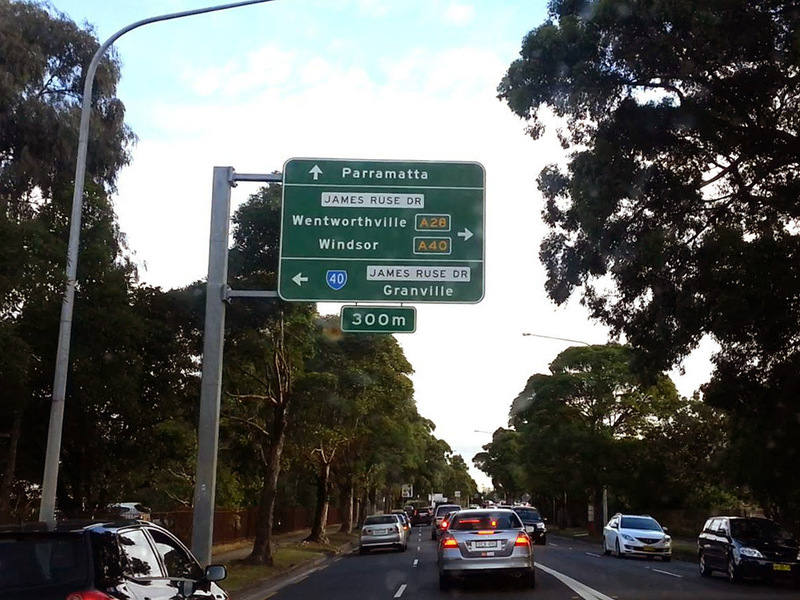 Note the differently sized route markers on the same sign. 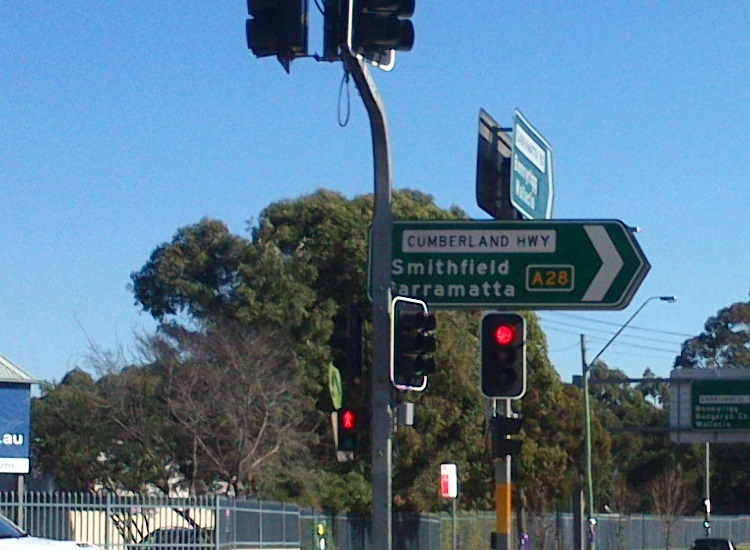 ID sign facing southbound traffic at the junction of Cumberland Highway, Polding Street & Smithfield Road, Fairfield West. 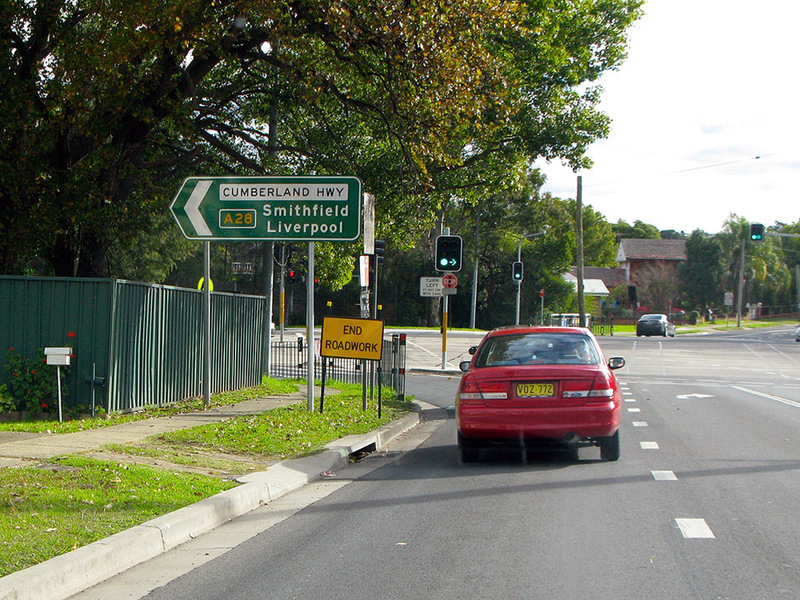 ID sign facing northbound traffic at the junction of Cumberland Highway, Polding Street & Smithfield Road, Fairfield West. Source: Andrew Ison, July 2013. 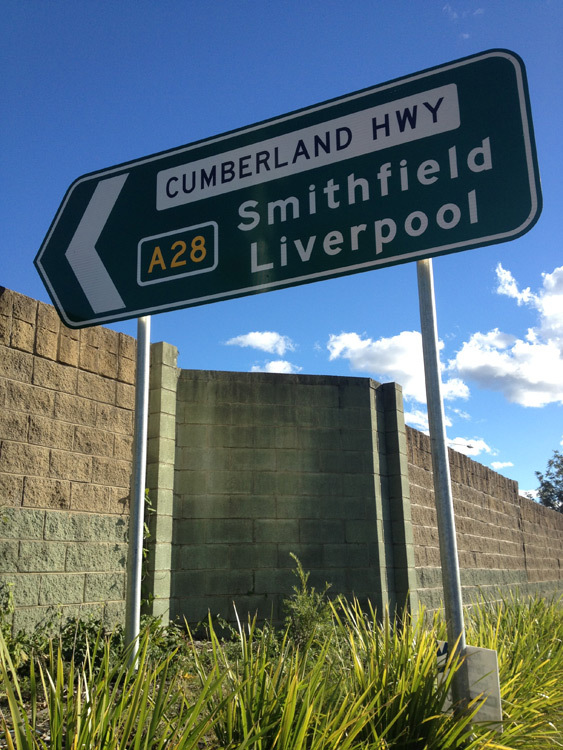 AD sign northbound on Cumberland Highway approaching the junction with Polding Street & Smithfield Road, Fairfield West. Source: Michael Mak, May 2013. 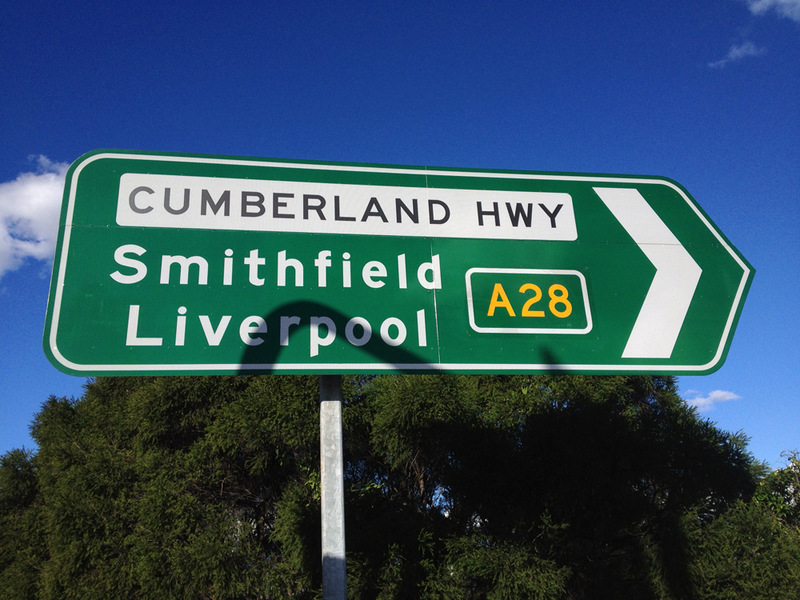 RD sign southbound on Cumberland Highway after the junction with Polding Street & Smithfield Road, Fairfield West. 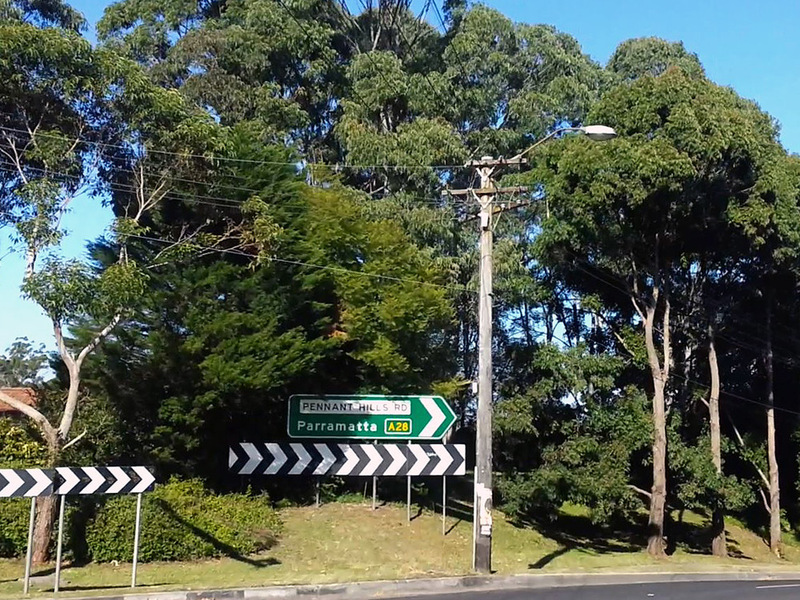 Unusual double-chevron ID sign at the junction of Cumberland Highway & Hamilton Road, Fairfield West. 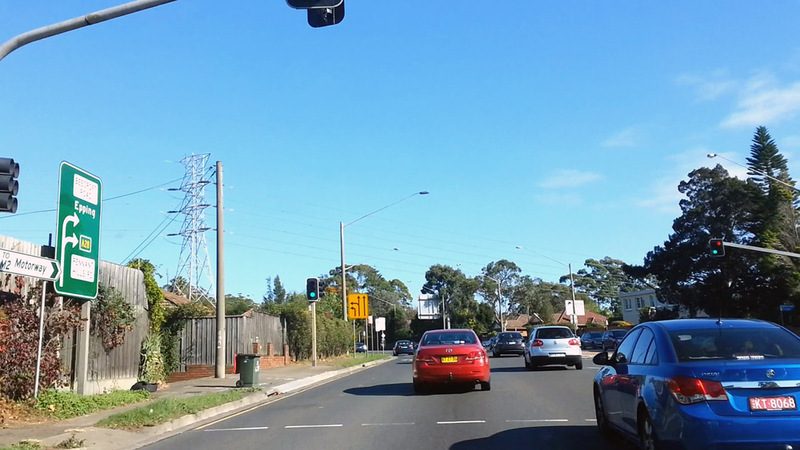 ID sign assembly at the junction of Cumberland Highway & St Johns Road, Canley Heights. 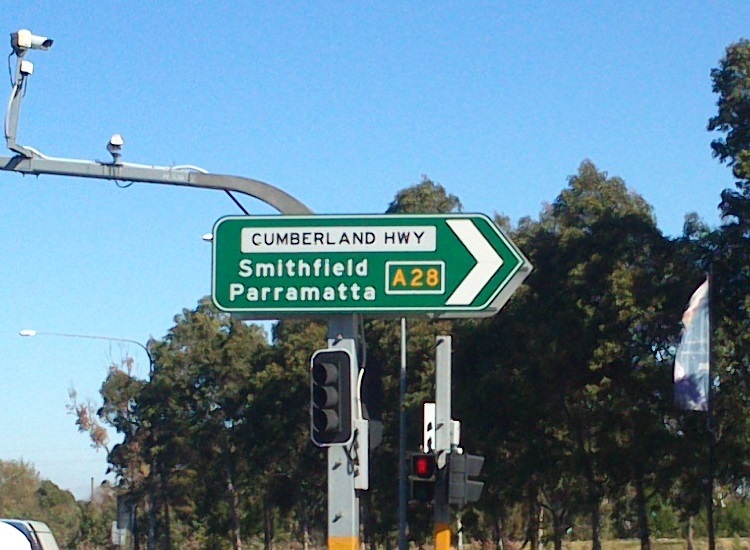 AD sign westbound on Cabramatta Road approaching the junction with Cumberland Highway, Cabramatta. 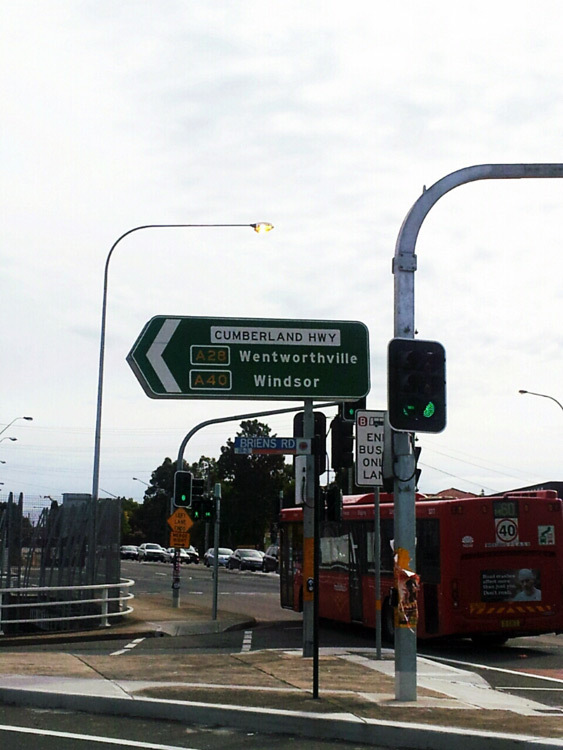 ID signs at the junction of Cumberland Highway & Cabramatta Road, Cabramatta. Note the RD sign in the background of the bottom photo which dates from the late-1990s and still has SR50 under a blank coverplate. 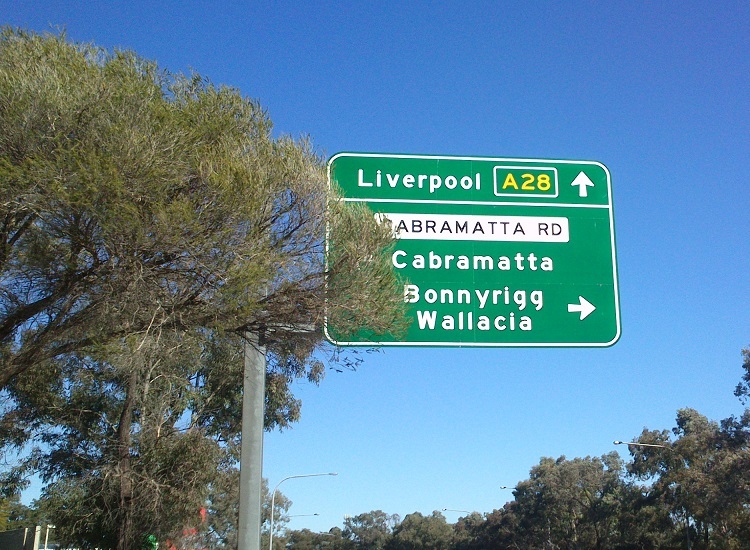 AD sign northbound on Cumberland Highway approaching the junction with Cabramatta Road, Cabramatta. 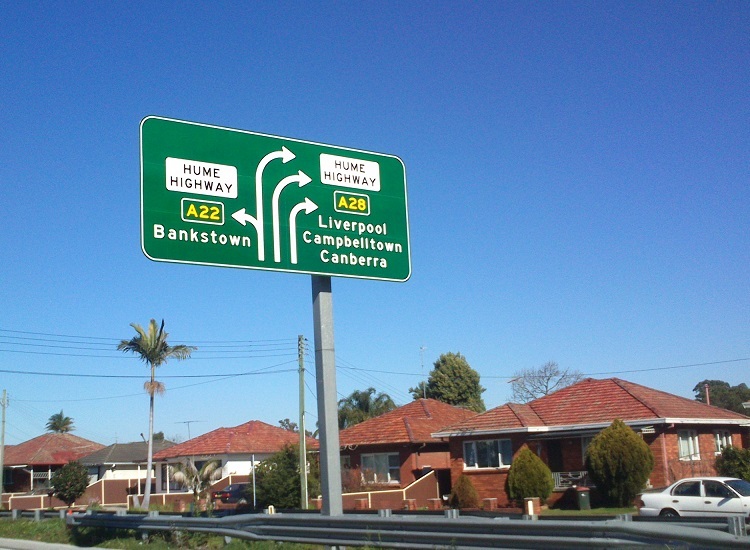 Lane allocation AD sign southbound on Cumberland Highway approaching the junction with Hume Highway, Liverpool. 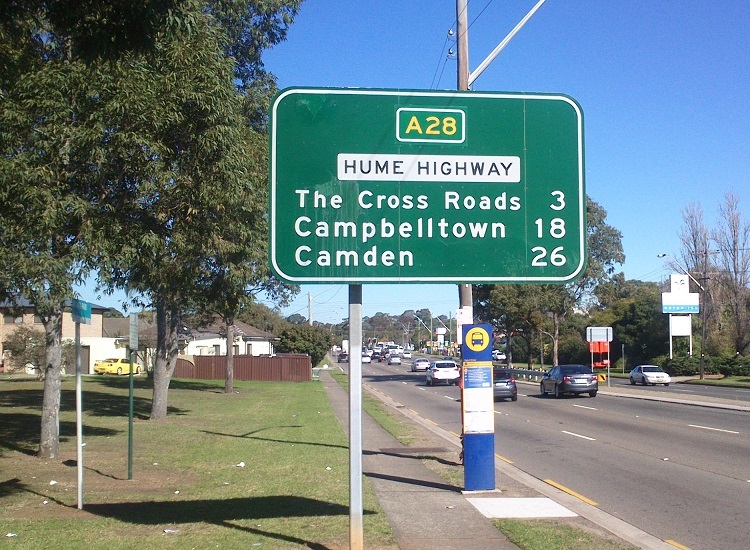 This is the western terminus of A22; A28 continues south along the Hume Highway to Prestons. 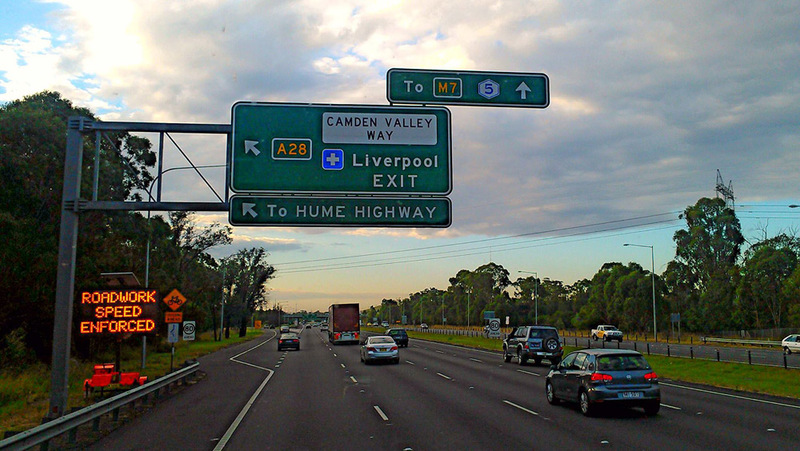 Lane allocation AD sign westbound on Hume Highway approaching the junction with Cumberland Highway, Liverpool. 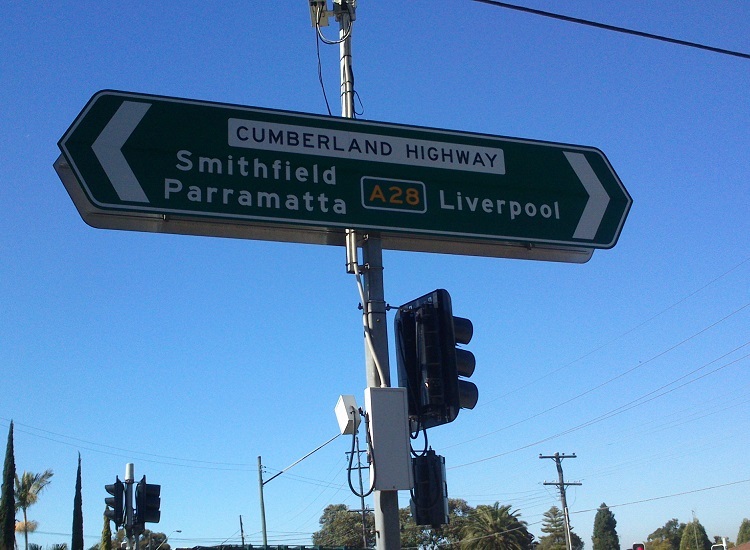 ID signs at the junction of Hume Highway & Cumberland Highway, Liverpool. 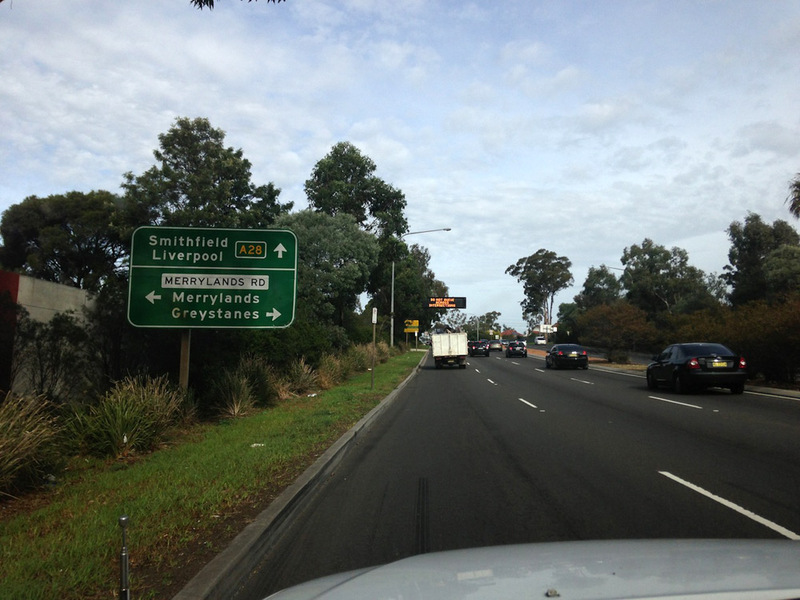 AD sign southbound on Hume Highway (Copeland Street) approaching the junction with Elizabeth Drive, Liverpool. 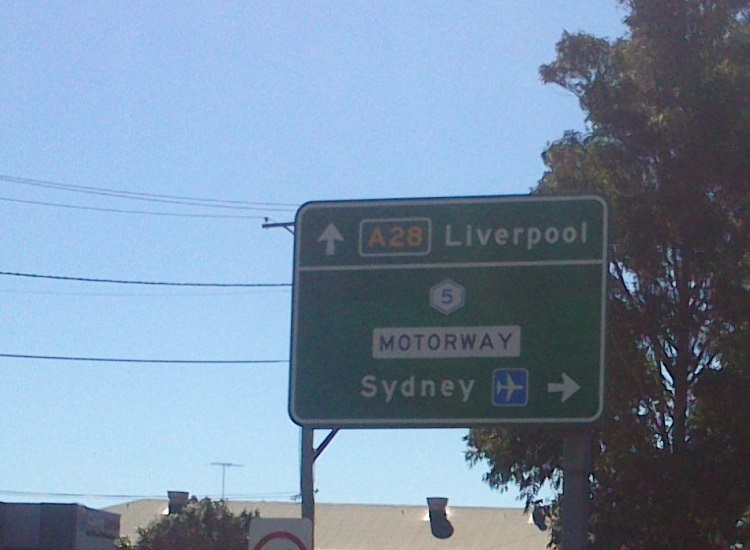 AD sign southbound on Hume Highway (Copeland Street) approaching the junction with Macquarie Street & Hoxton Park Road, Liverpool. 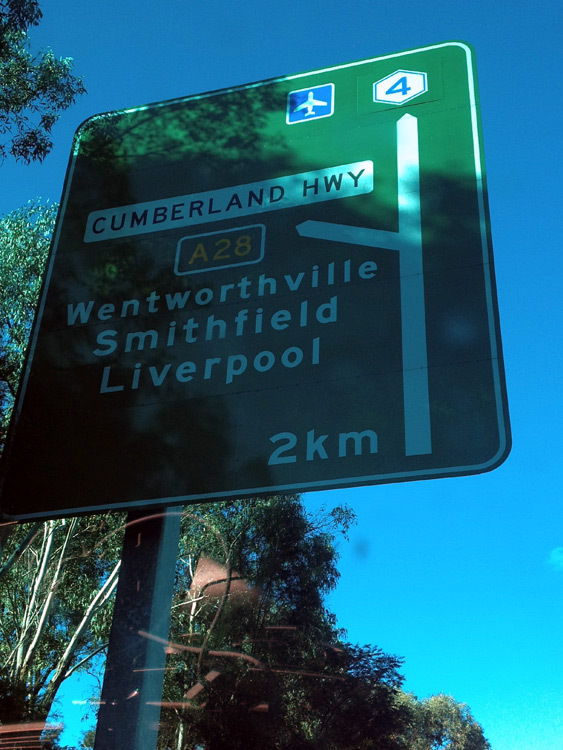 This is the western terminus of A34. 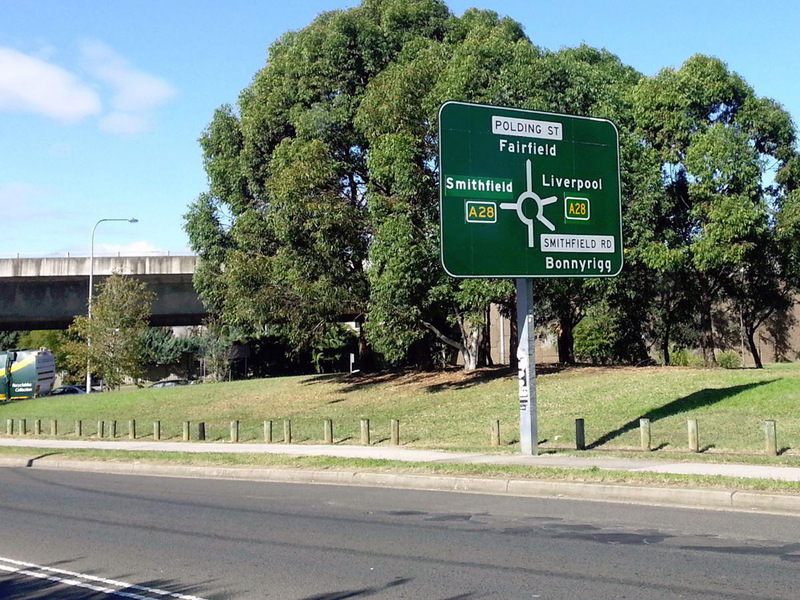 Lane allocation AD sign southwest bound on Macquarie Street (A34) approaching the junction with Hume Highway & Hoxton Park Road, Liverpool. 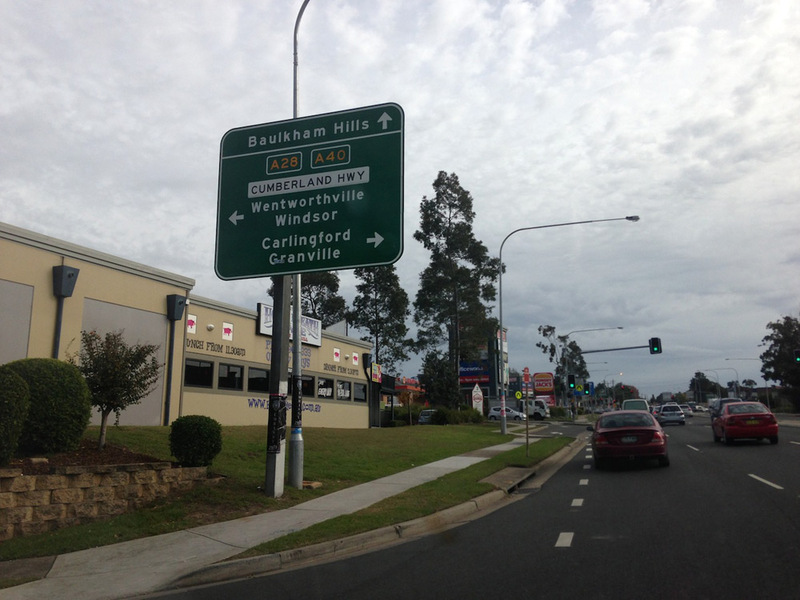 This is the western terminus of A34. 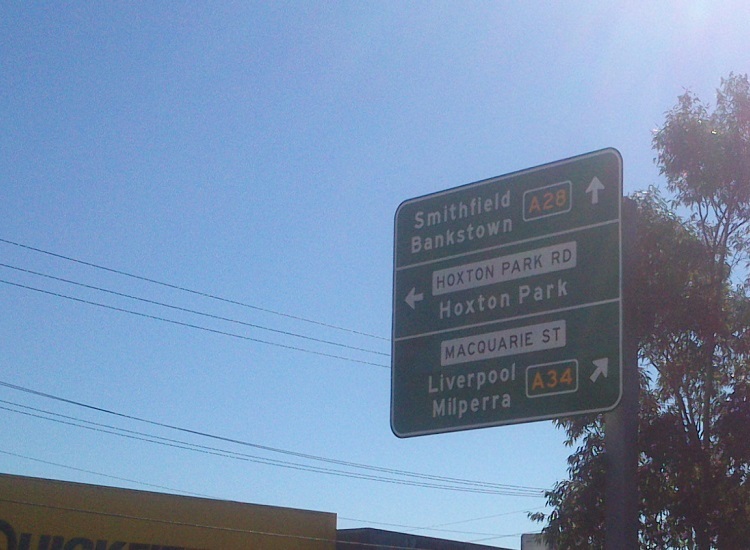 AD sign northbound on Hume Highway approaching the junction with Hoxton Park Road & Macquarie Street, Liverpool. 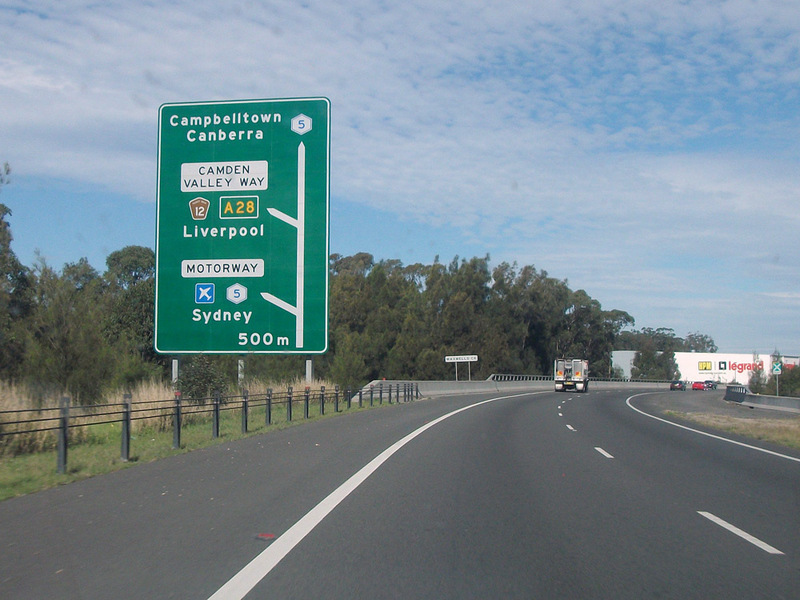 Exit Direction sign westbound on the South Western Motorway (M5) at the Hume Highway (A28) interchange, Casula. 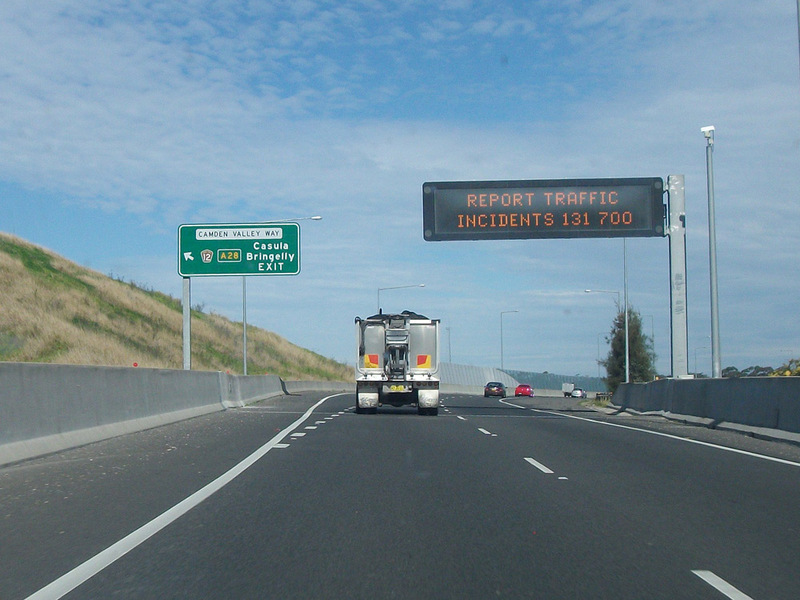 AD sign northbound on Hume Highway approaching the junction with the South Western Motorway (M5), Casula. 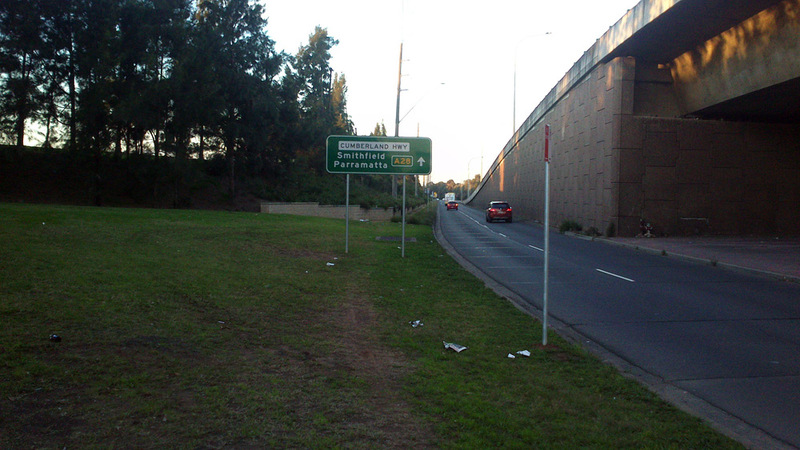 Note the M5 route marker has not yet been uncovered. 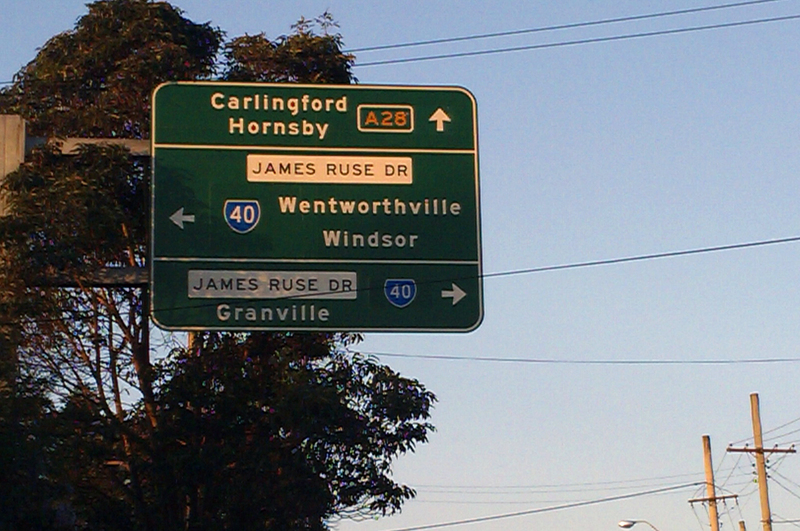 RD sign southbound on Hume Highway after the junction with the South Western Motorway (M5), Casula. 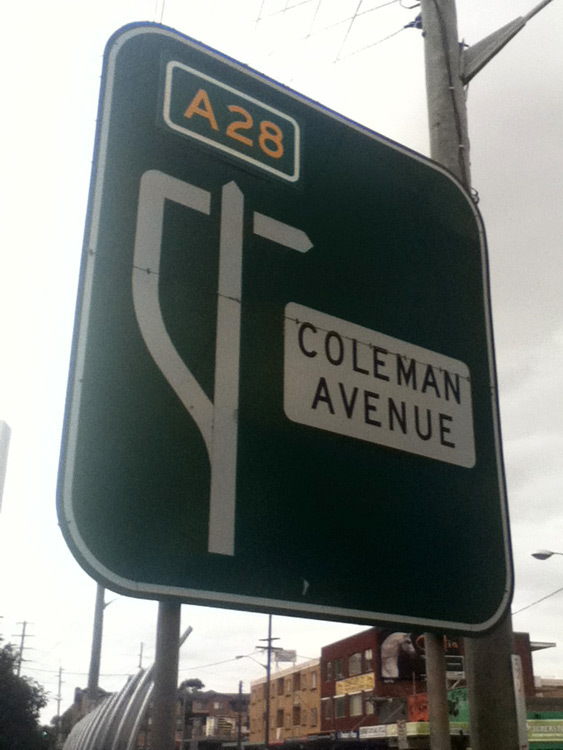 This sign was not replaced as part of the alpha-numeric route marking scheme - it still has a Metroad 7 shield beneath the coverplate. 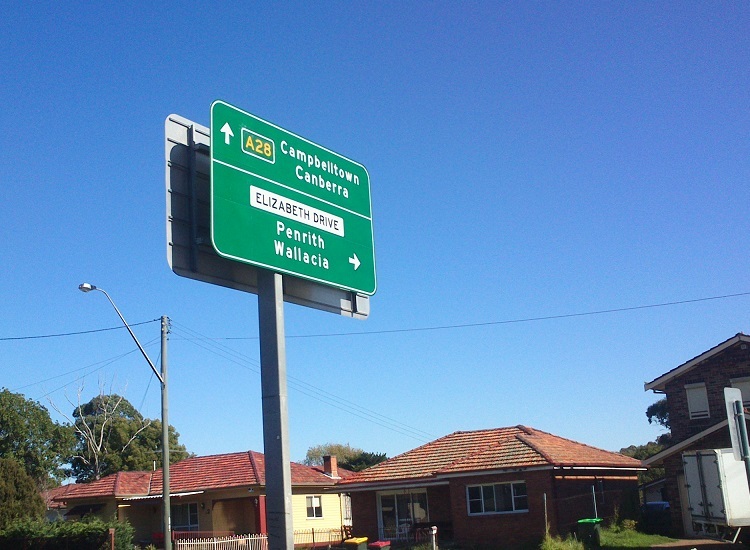 AD sign northbound on Campbelltown Road approaching the junction with Hume Highway & Camden Valley Way at The Cross Roads. 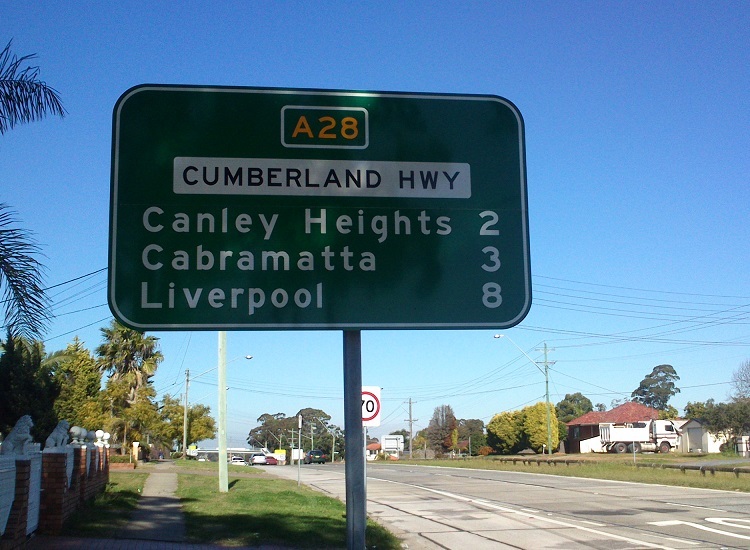 This is the first mention of A28 northbound on Campbelltown Road. 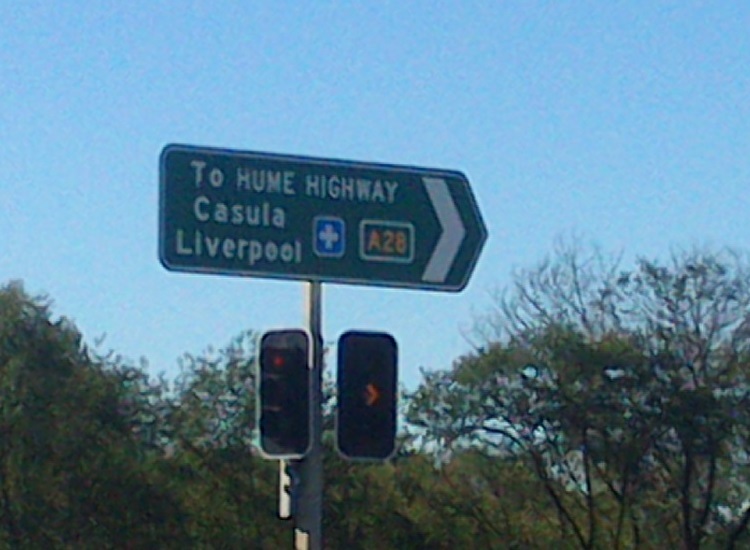 Note the wide spacing used for the 'Hume Highway' name patch which looks a little weird. 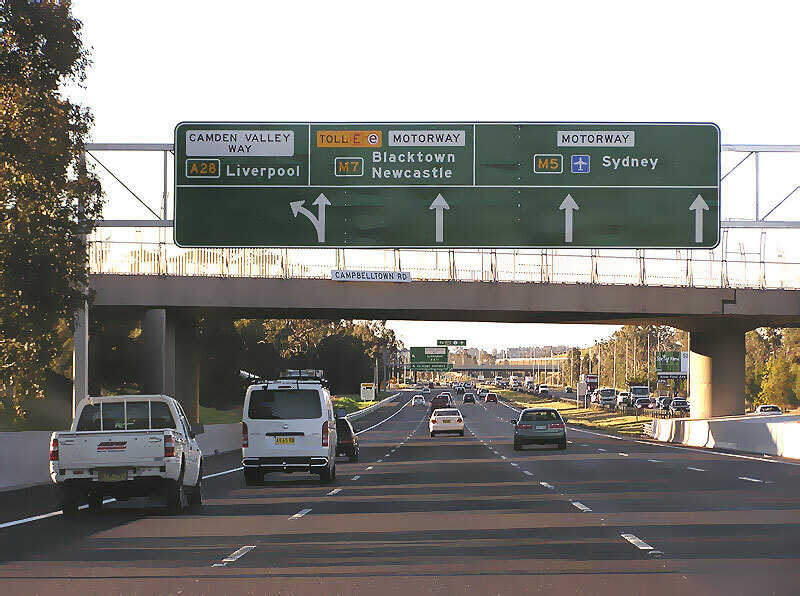 Southbound signage on the Westlink M7 approaching the Camden Valley Way interchange at Prestons, showing A28 uncovered but M5 and M31 still covered. 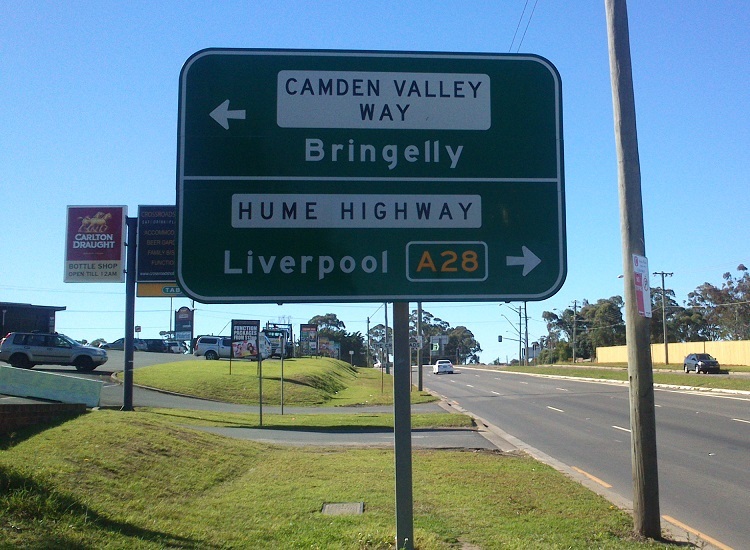 Note the change in focal points - Liverpool is shown on the first sign and Casula/Bringelly shown on subsequent signs. 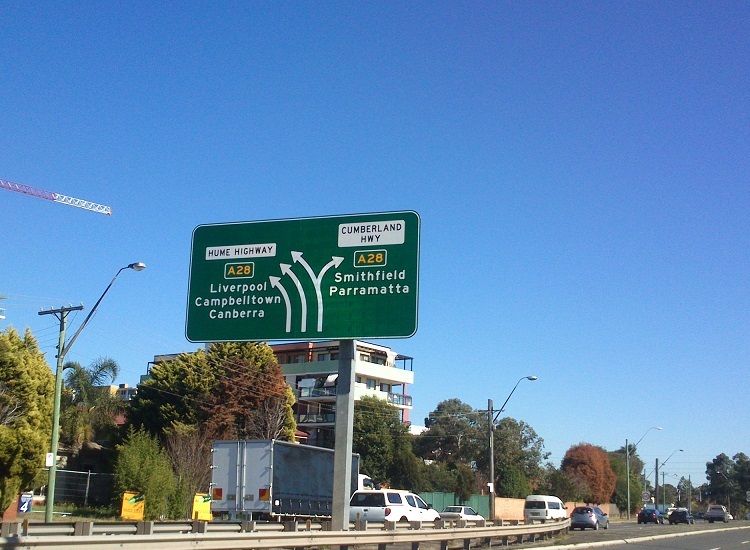 ID sign facing northbound traffic at the South Western Motorway/Camden Valley Way interchange, Prestons. 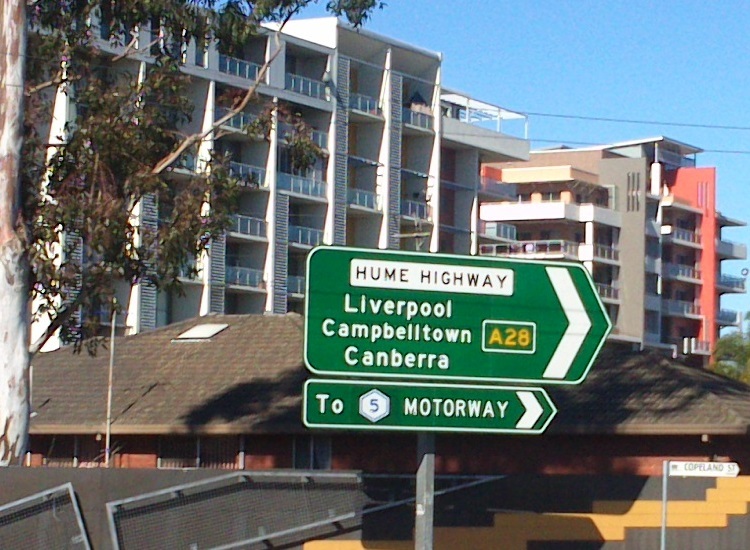 Note the use of 'To Hume Highway' even though the section of Camden Valley Way east of this interchange is gazetted as part of the Hume Highway under the Roads Act 1993. 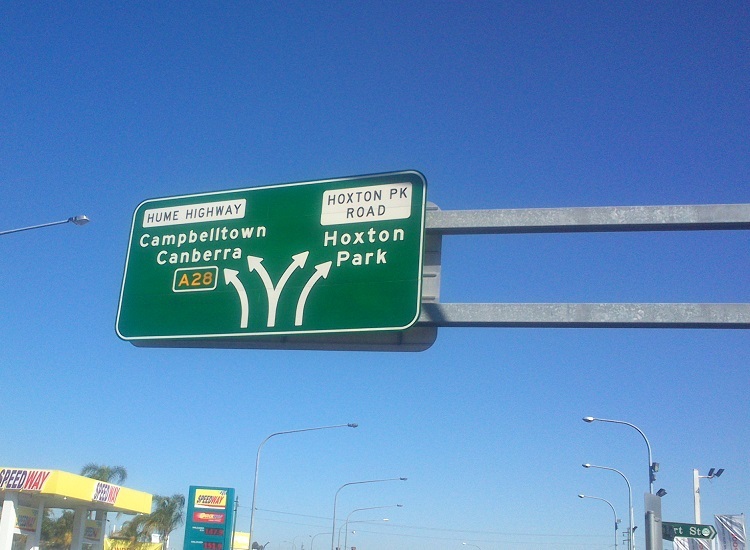 Exit Direction sign assembly northbound on Hume Motorway at the junction with Camden Valley Way, Prestons. 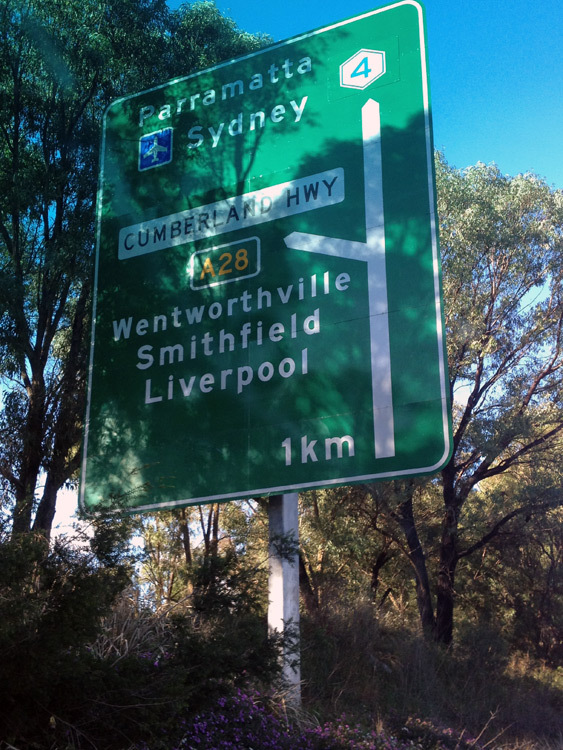 This is the southern terminus of A28. 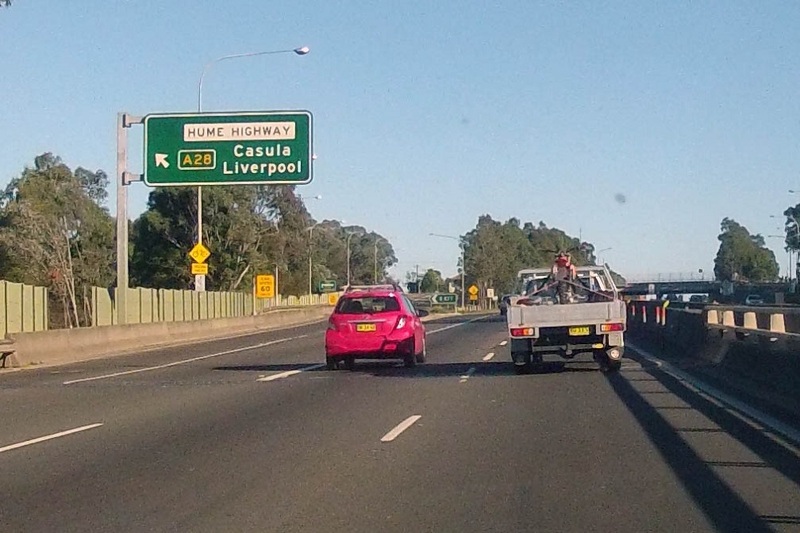 A prematurely exposed A28 route marker, northbound on Hume Motorway approaching the junction with Camden Valley Way, Prestons. 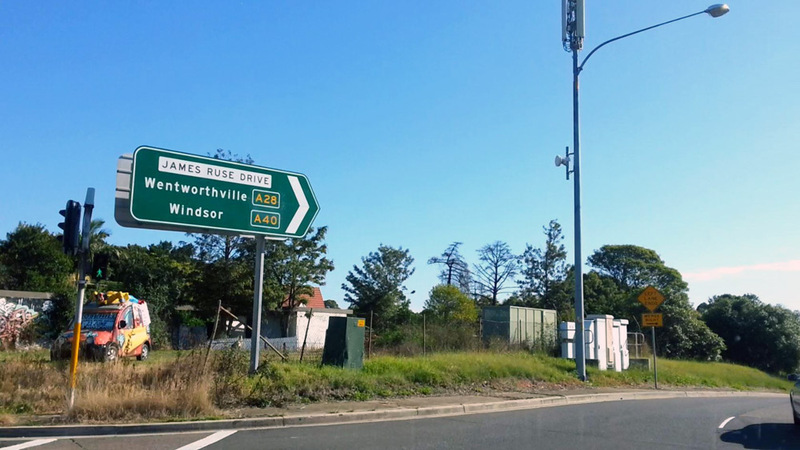 This sign was subsequently coverplated and then uncovered in late May/early June 2013.